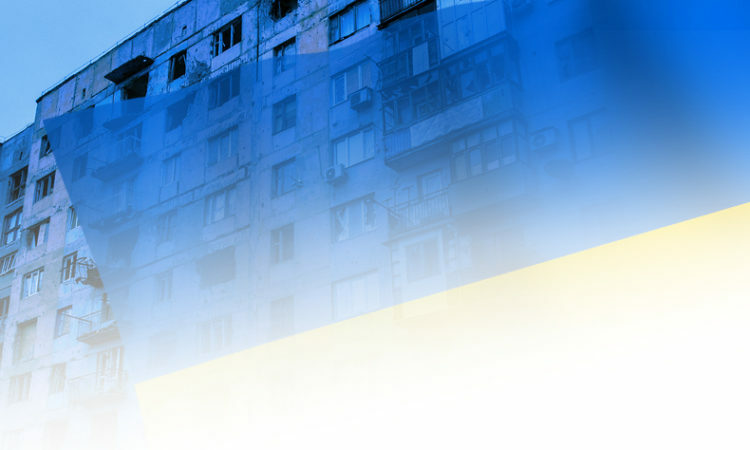 Remarks delivered at 26 February event "FIVE YEARS AFTER: Human Rights Situation in Autonomous Republic of Crimea"
Statement to the Permanent Council on Russia's Ongoing Violations in Ukraine. 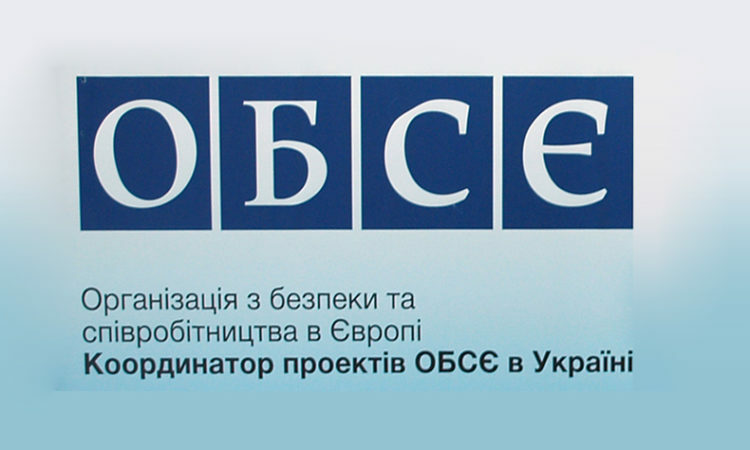 Statement to the Permanent Council on Russia's Ongoing Violations of International Law and Defiance of OSCE Principles in Ukraine. 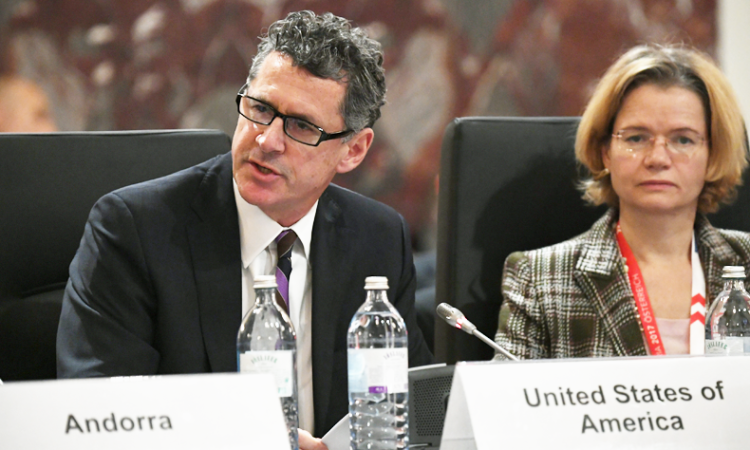 U.S. response to the statement by Ms. Dunja Mijatović, Commissioner on Human Rights for the Council of Europe. 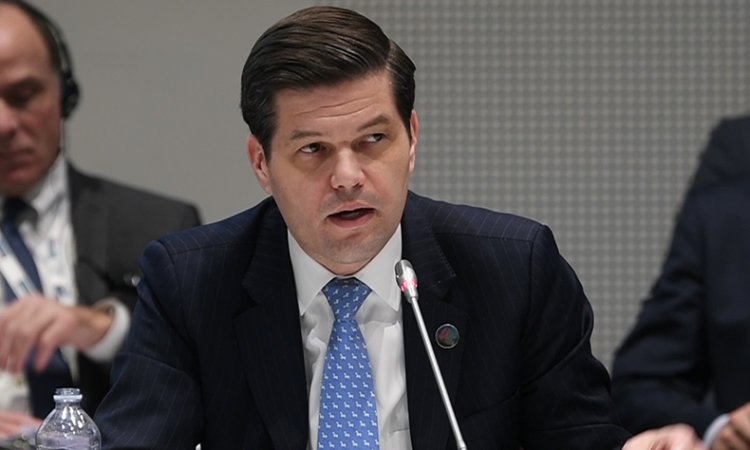 Assistant Secretary of State A. Wess Mitchell's remarks to the First Plenary Session of the 2018 OSCE Ministerial Council meeting. 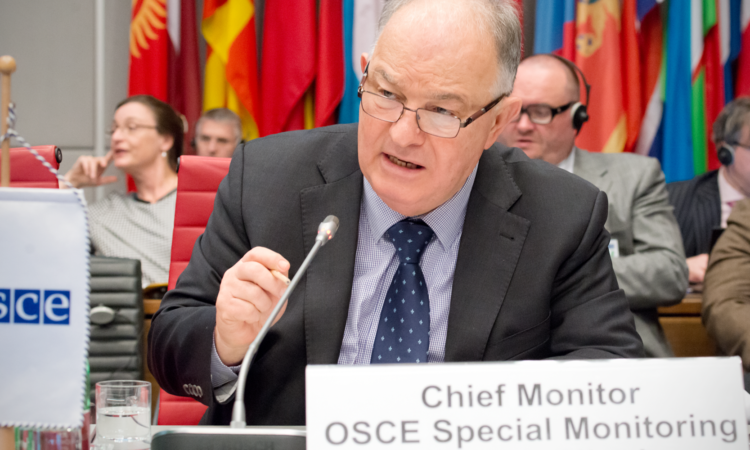 Statement in Response to the OSCE’s Chief Monitor in Ukraine, Ambassador Apakan, and the Chairperson in Office’s Special Representative, Ambassador Sajdik. 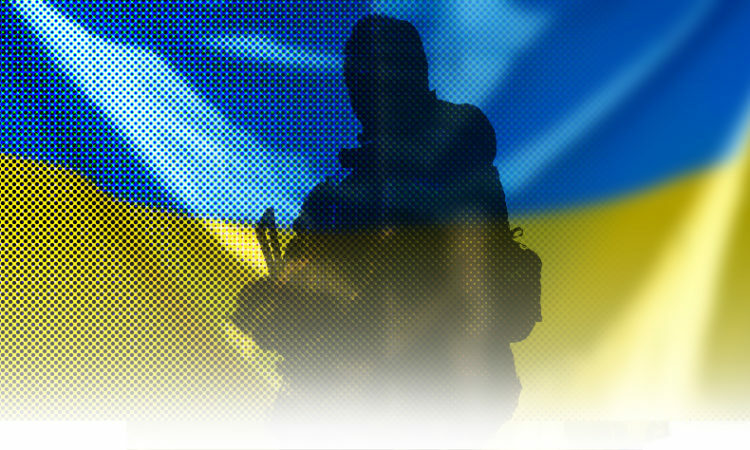 Statement to a special session of the Permanent Council on the Illegal “Elections” in Donbas. 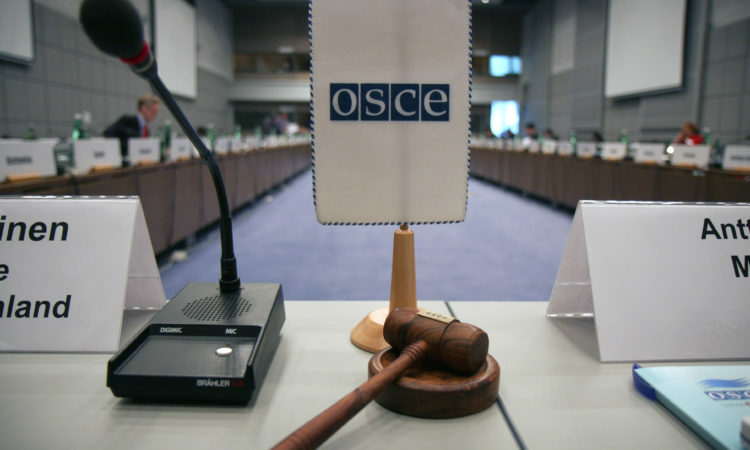 Statement to the Permanent Council on Russia's Ongoing Violations of International Law and Defiance of OSCE Principles and Commitments in Ukraine. 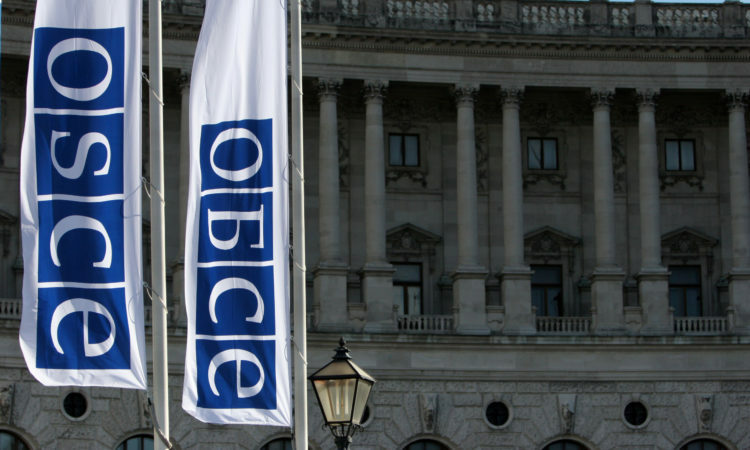 Ongoing Violations of International Law and Defiance of OSCE Principles and Commitments by the Russian Federation in Ukraine. U.S. 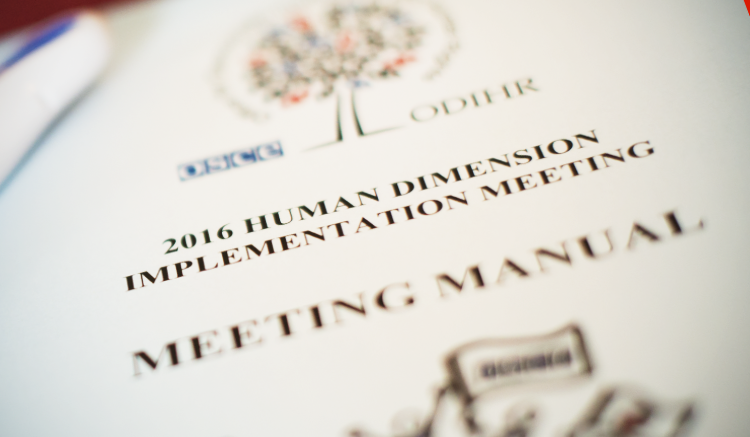 Opening Statement at the 2018 Human Dimension Implementation Meeting, Warsaw, September 10, 2018. 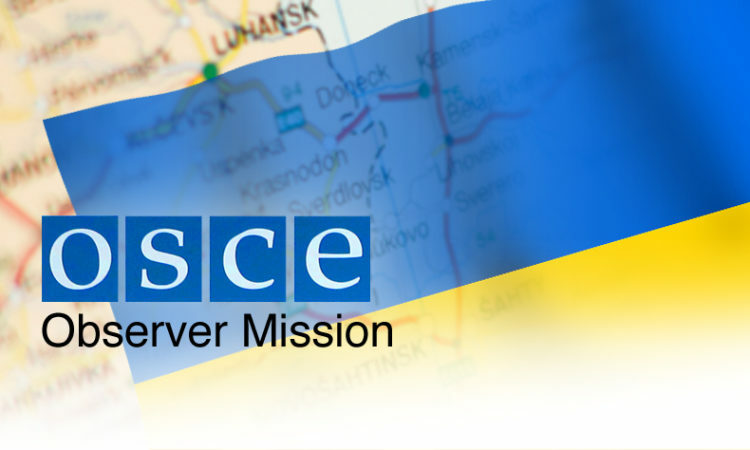 Interpretative Statement on the Extension of the Observer Mission to Two Checkpoints on the Russian-Ukrainian Border. 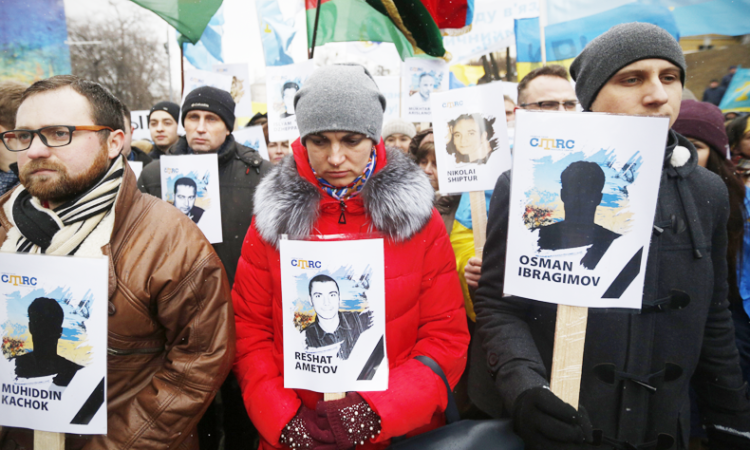 On the Hunger Strike of Imprisoned Ukrainian Film Director Oleg Sentsov. 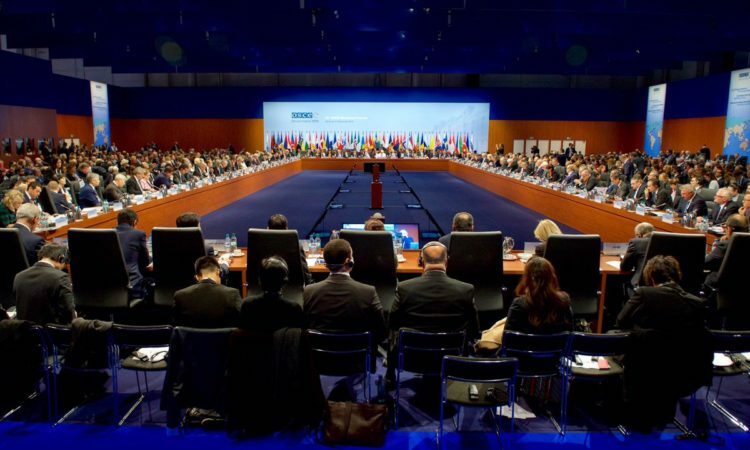 Russia has acted in a manner unworthy of a great nation and has chosen to isolate itself from the international community. 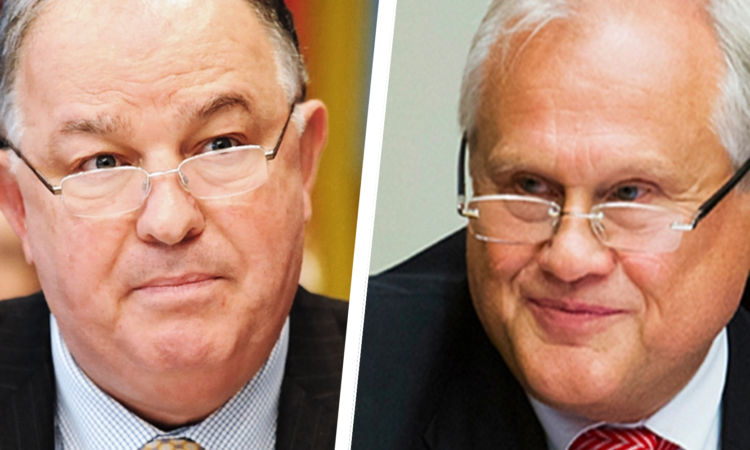 Response to the OSCE’s Chief Monitor in Ukraine, Ambassador Ertugrul Apakan, and the OSCE Chairperson-in-Office’s Special Representative in Ukraine and in the Trilateral Contact Group, Ambassador Martin Sajdik. 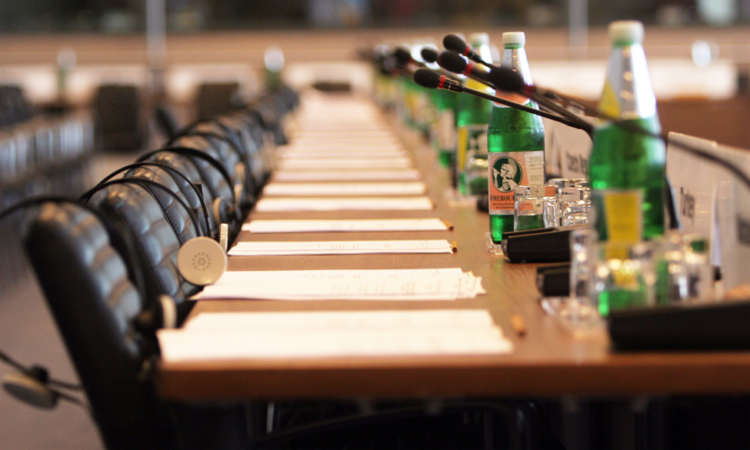 Interpretative statement on the extension of the mandate of the Project Coordinator in Ukraine. 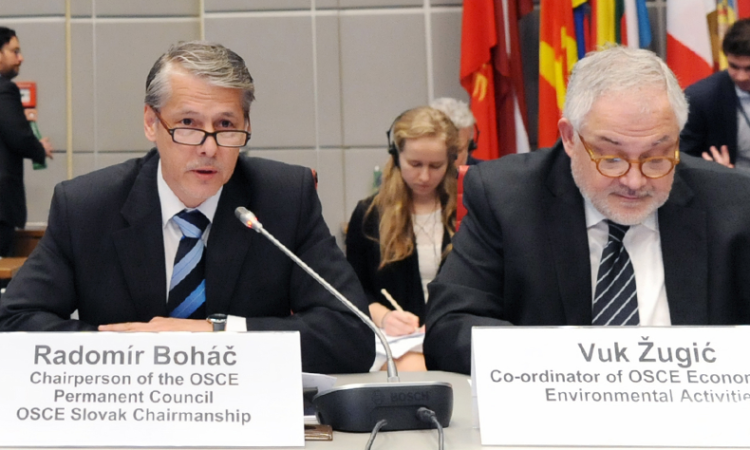 Response to the report by the OSCE Project Coordinator in Ukraine, Ambassador Vaidotas Verba, to the Permanent Council. 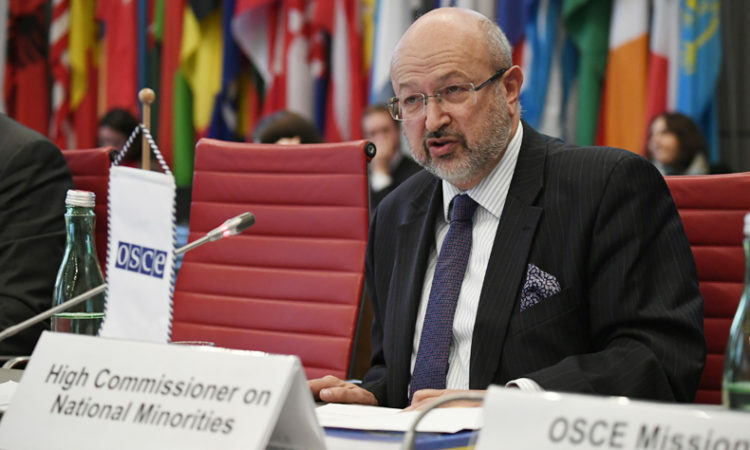 Response to OSCE High Commissioner on National Minorities, Lamberto Zannier's report to the Permanent Council. 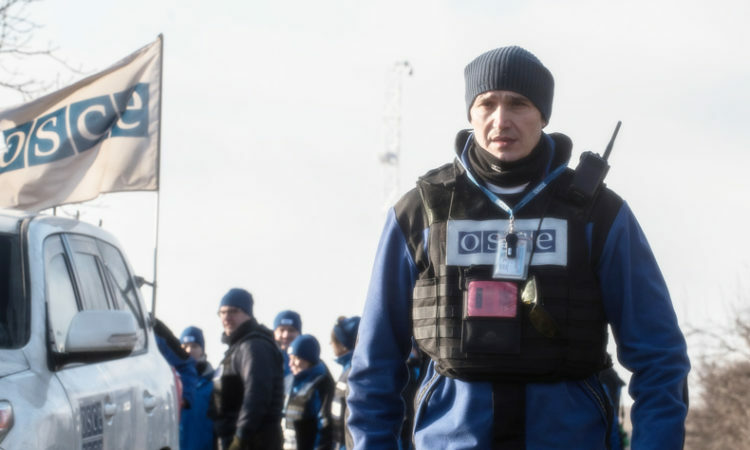 Statement to the Permanent Council in response to the report by the Chief Observer of the OSCE Observer Mission at the Russian Checkpoints Gukovo and Donetsk, Ambassador György Varga. 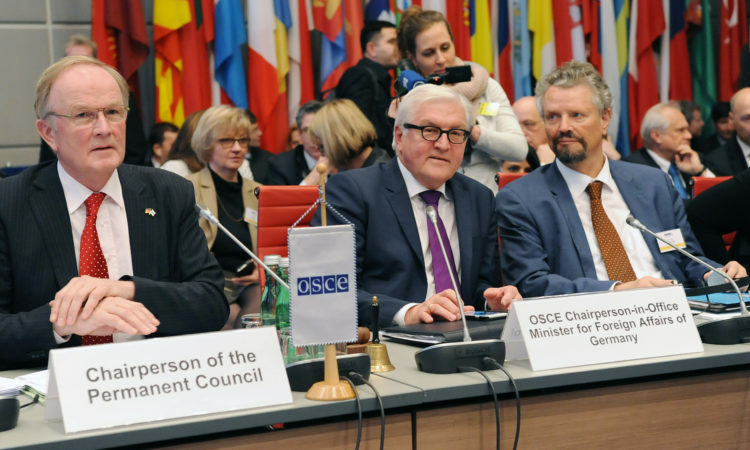 Statement at the Permanent Council on Russia's ongoing violations of international law and defiance of OSCE principles and commitments in Ukraine. 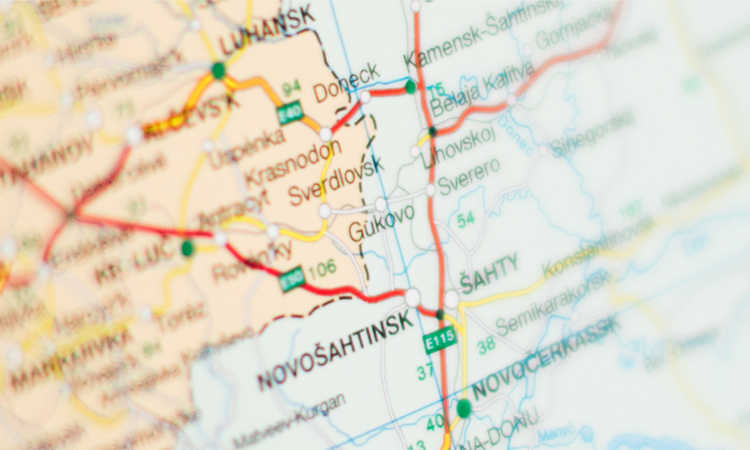 Statement to the Permanent Council on the 32nd Anniversary of the accident at the Chornobyl Nuclear Power Station. 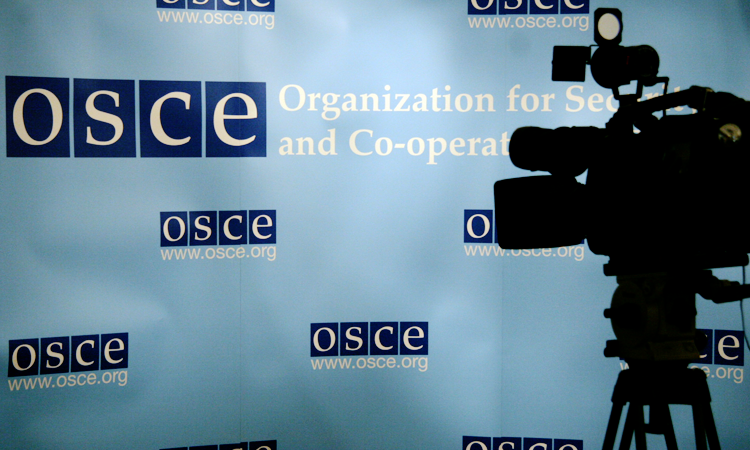 Response to Ukraine Reports by OSCE’s Chief Monitor and Chairmanship’s Special Rep. 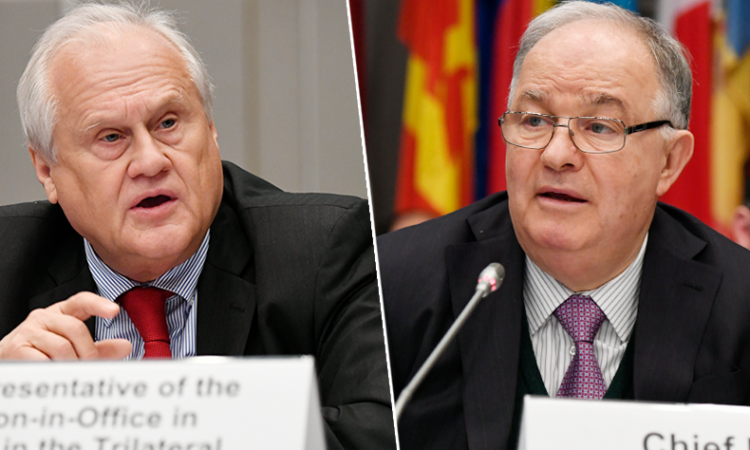 Response at the Permanent Council to the peports by OSCE’s Chief Monitor in Ukraine, Ambassador Ertugrul Apakan, and the Chairperson-in-Office's Special Representative, Ambassador Martin Sajdik. 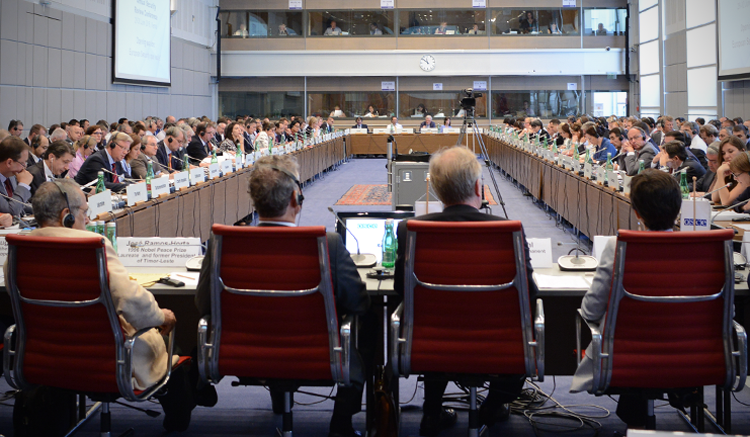 Statement at the Permanent Council on Russia's ongoing violations in Ukraine. 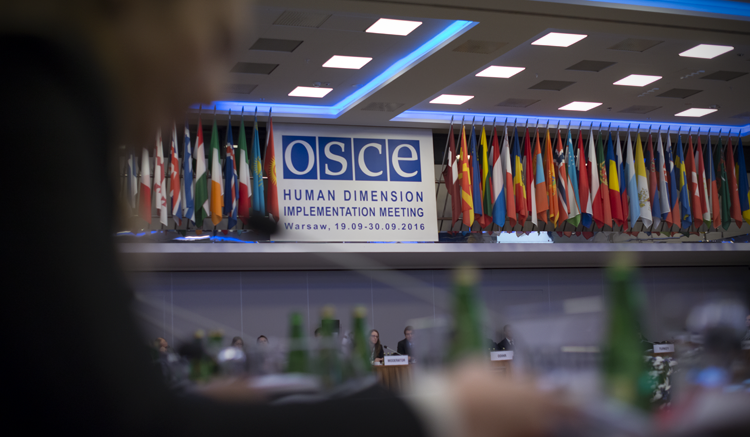 By definition, elections conducted by the occupation authorities or under Russian law in Crimea have no legitimacy. 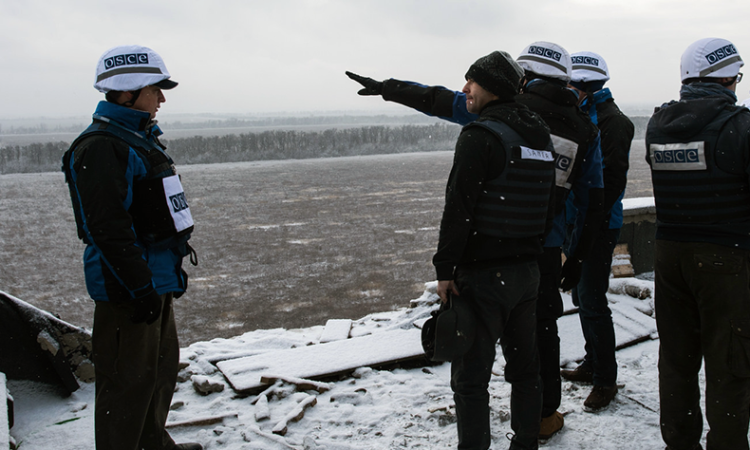 We stress, once again, that attacks, threats, and intimidation of any kind against SMM monitors are unacceptable, inconsistent with this mandate, and must end. 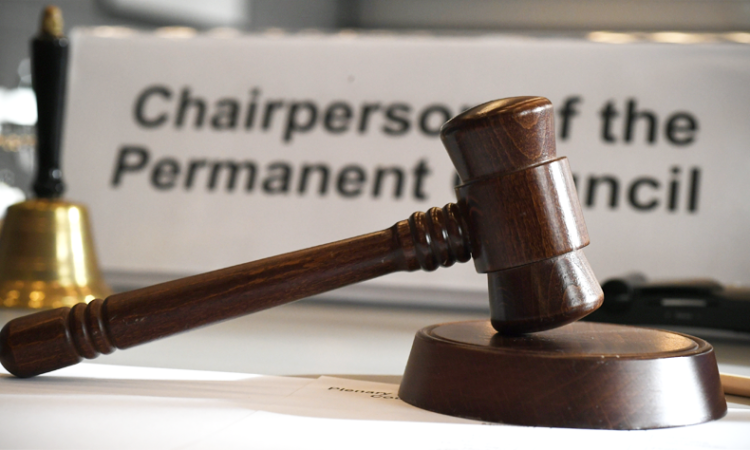 Statement at the Permanent Council rejecting the Russian Federation’s conduct of a sham election in Crimea. 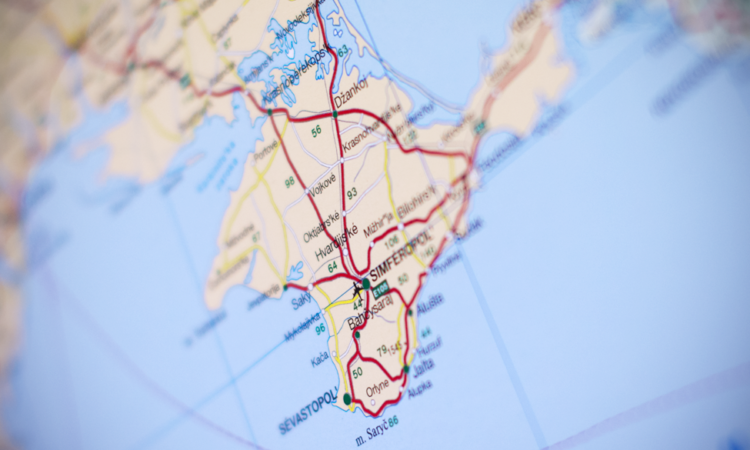 Statement at the Permanent Council on Russia's ongoing, four-year occupation of Crimea. 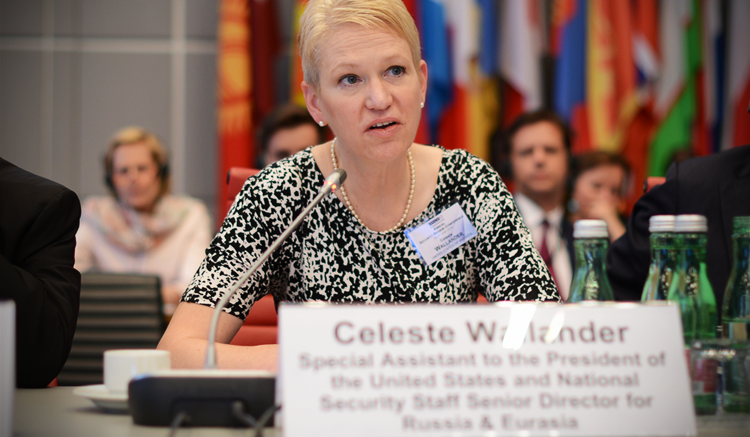 Introductory remarks at a side event on human rights defenders in Crimea. 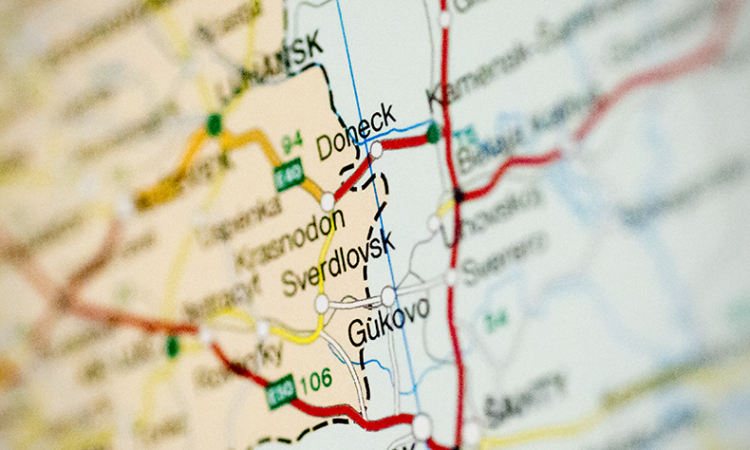 Statement at the Permanent Council in response to the head of the observer mission at two checkpoints on the Russia-Ukraine border. 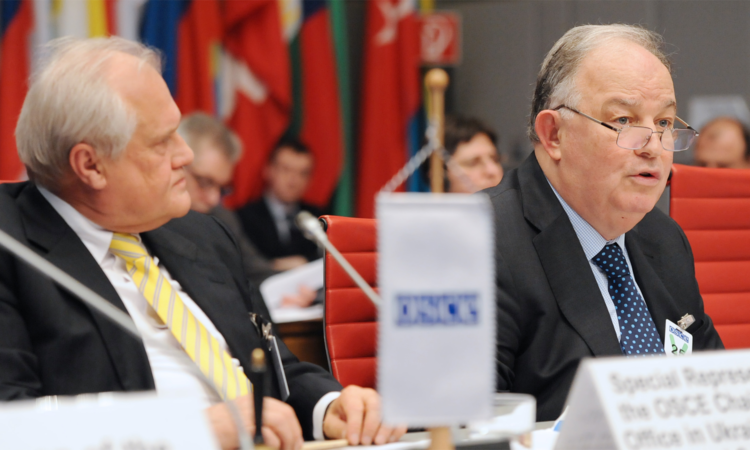 Statement at the Permanent Council: Response to Ambassadors Ertugrul Apakan and Martin Sajdik. 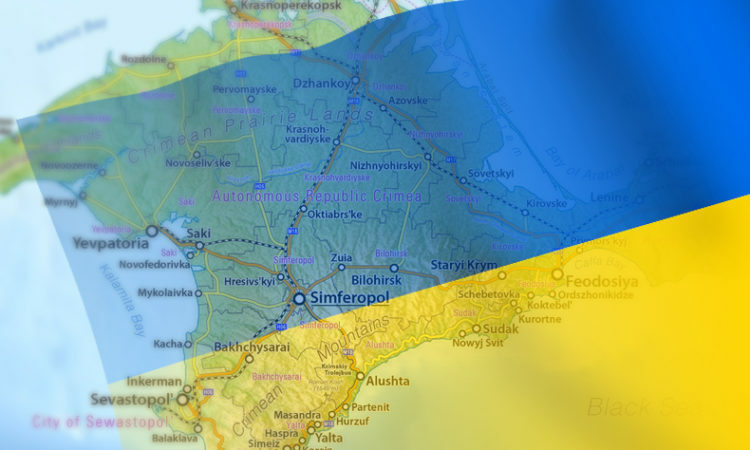 Interpretative Statement delivered at the Permanent Council on the Extension of the Observer Mission to Two Checkpoints on the Russian-Ukrainian Border. 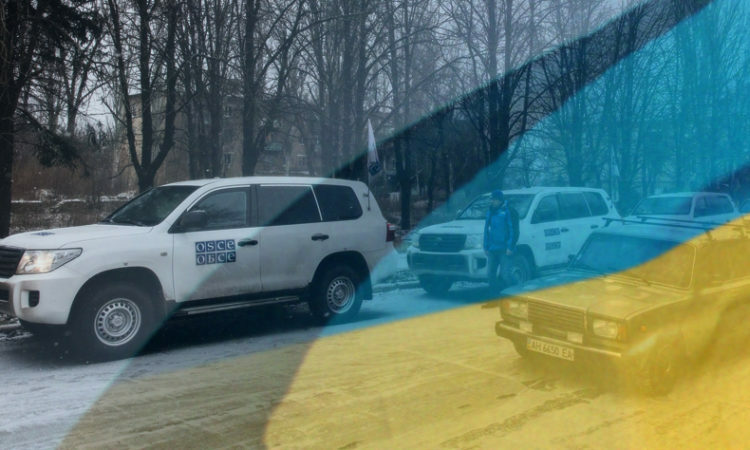 A summary of U.S. activities at the OSCE between January 15 and January 19, 2018. 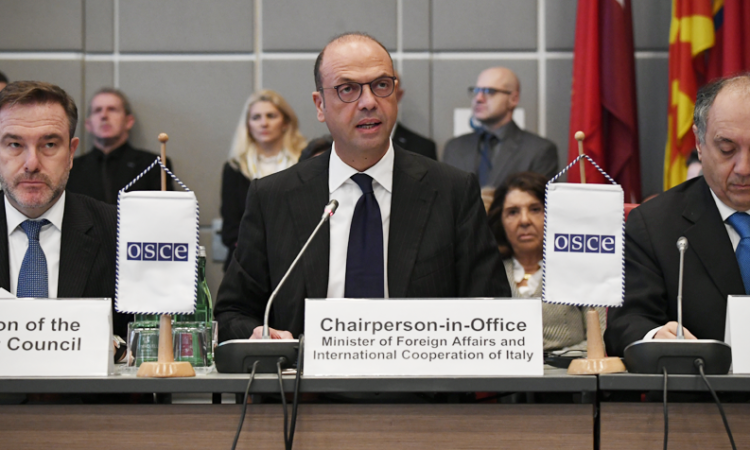 Response to Italian Foreign Minister Angelino Alfano's presentation to the Permanent Council of his goals as 2018 OSCE Chairperson-in-Office. 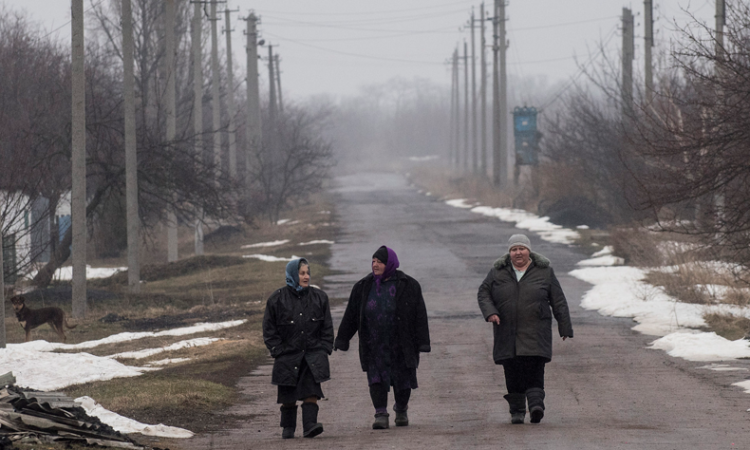 The fighting in the Donbas continues to worsen, reaching a level similar to that last experienced in January and February of 2017. 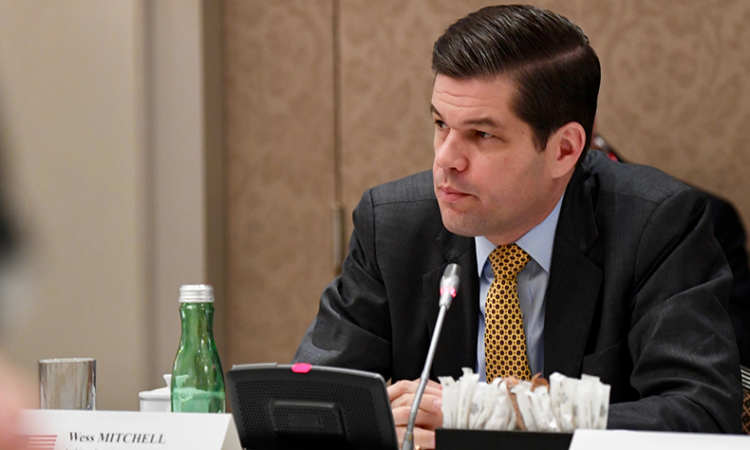 The State Department’s top official for European and Eurasian Affairs, Wess Mitchell, condemned Russia’s persecution of Crimean Tatars and voiced the United States’ unwavering support for Ukraine’s sovereignty and territorial integrity. 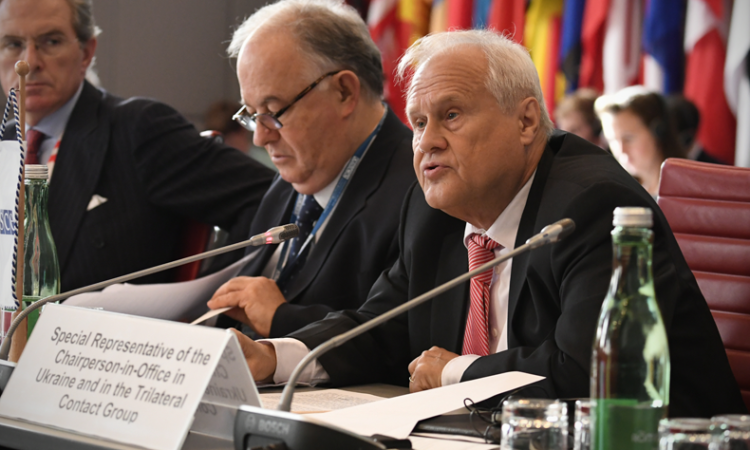 As this 24th OSCE Ministerial comes to a close, let us reflect for a moment on the vision rooted in the Helsinki Final Act and on what that should mean for all of us here today. 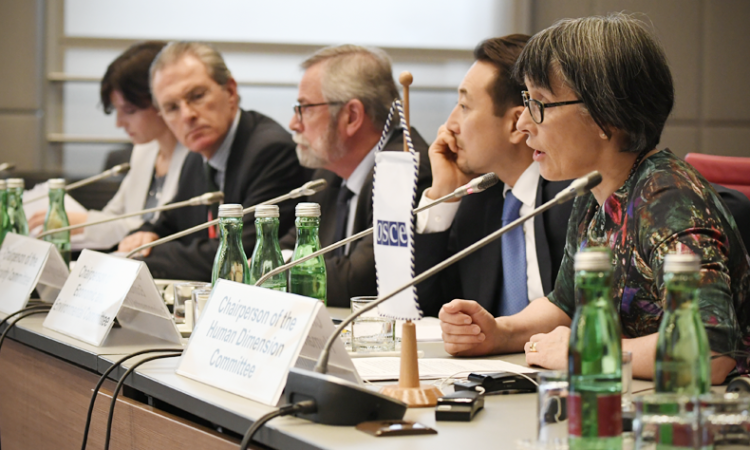 Whether it is ending the crisis in Ukraine, fighting terrorism, promoting human rights, or resolving longstanding conflicts, the OSCE is an important platform for addressing these challenges. 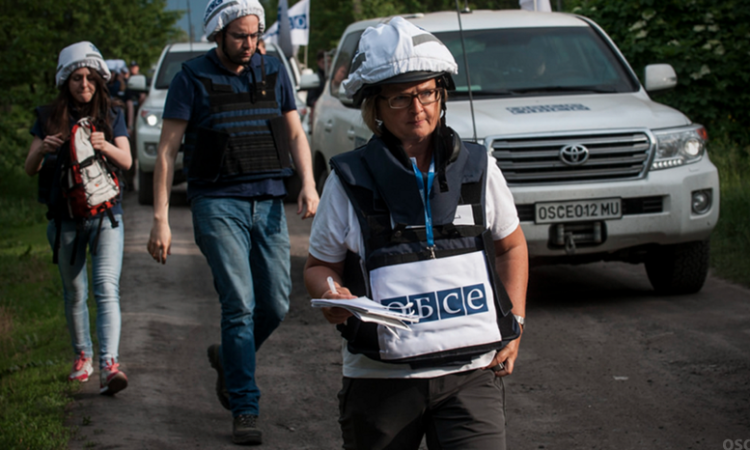 Response to Ukraine Reports by the OSCE’s Chief Monitor and Chairmanship’s Special Rep.
Ceasefire violations have now returned to higher levels than those recorded before the August 25 truce. 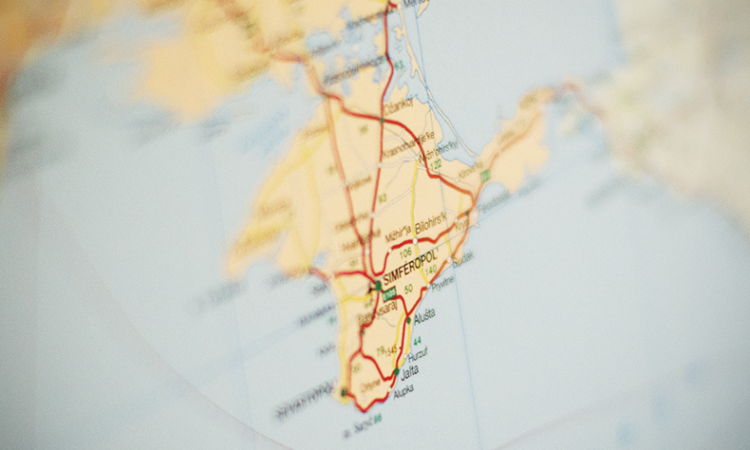 The mandate of the Project Coordinator in Ukraine applies to the entire country of Ukraine, including Crimea. 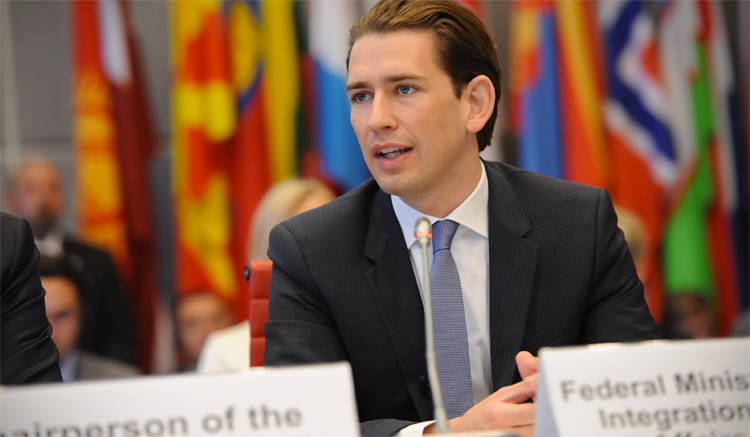 I’d like to make a substantive comment in response to the information that the Secretary General provided regarding the security situation in response to the question from the EU. 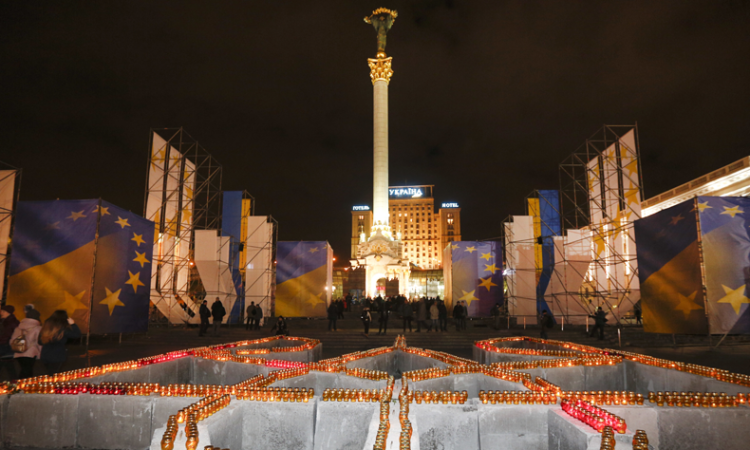 The United States joins the people of Ukraine in honoring the memory of the Revolution of Dignity and those who gave their lives to build a more just, democratic, and European Ukraine. 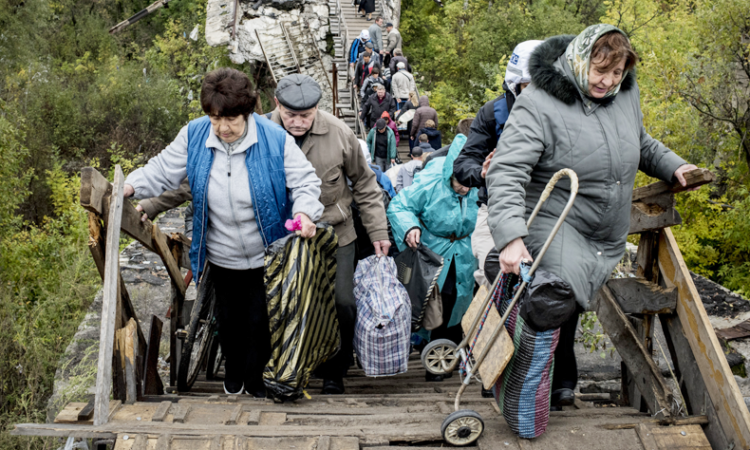 Russia’s willingness to exploit the vulnerabilities of critical civilian infrastructure leaves the civilian population exposed to unconscionable danger. 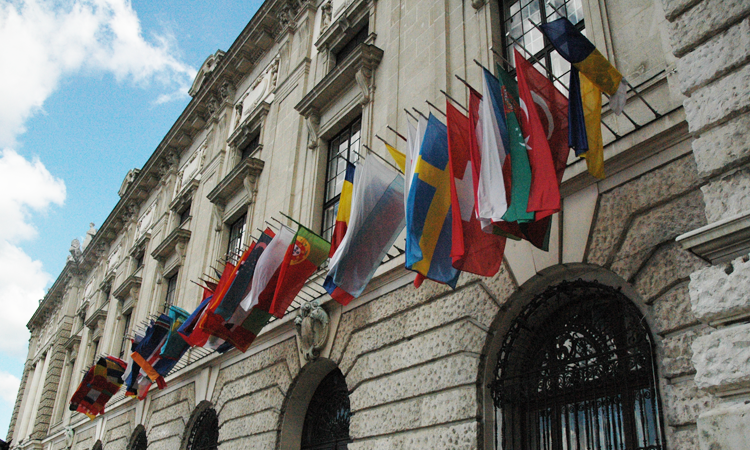 The HCNM plays a valuable role as we grapple with issues regarding ethnicity, language, and education, while respecting and protecting human rights and fundamental freedoms. 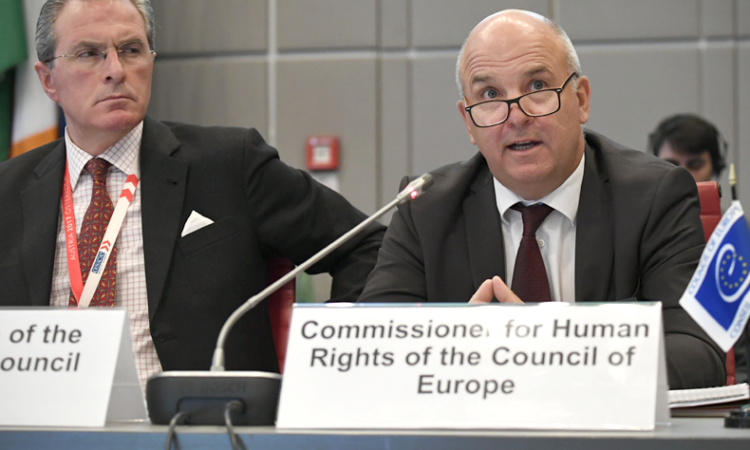 Response to the address by Nils Muižnieks, the Council of Europe's Commissioner for Human Rights, at the OSCE Permanent Council. 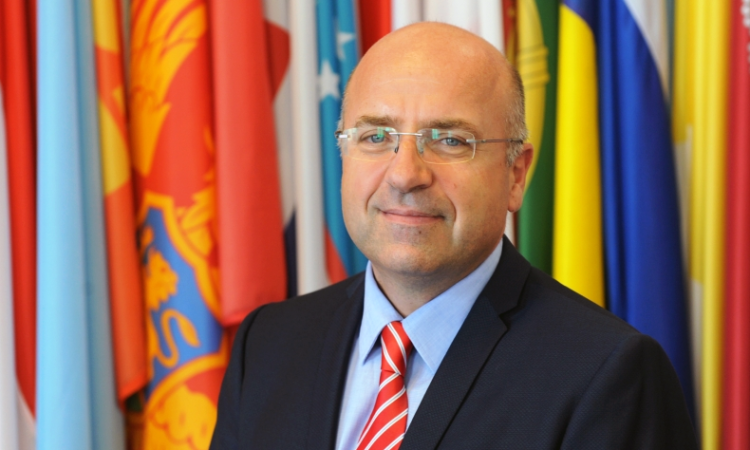 What is the OSCE Mission to Moldova? 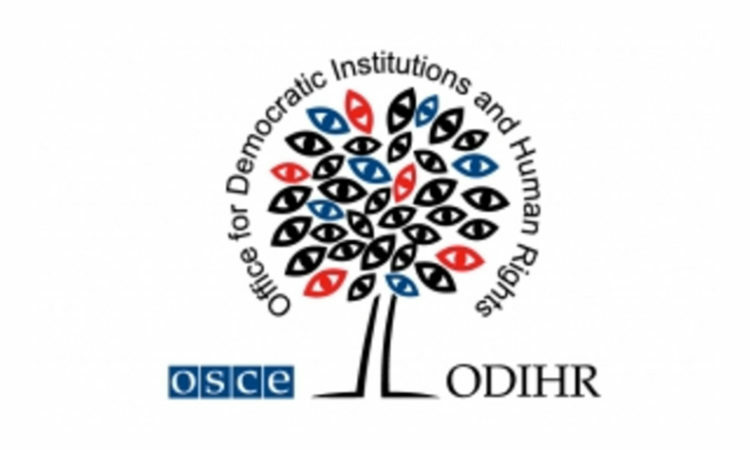 The OSCE Mission to Moldova plays a crucial role in the ongoing settlement process on the Transnistria conflict, and advises Moldova’s authorities on human rights and democratization issues. 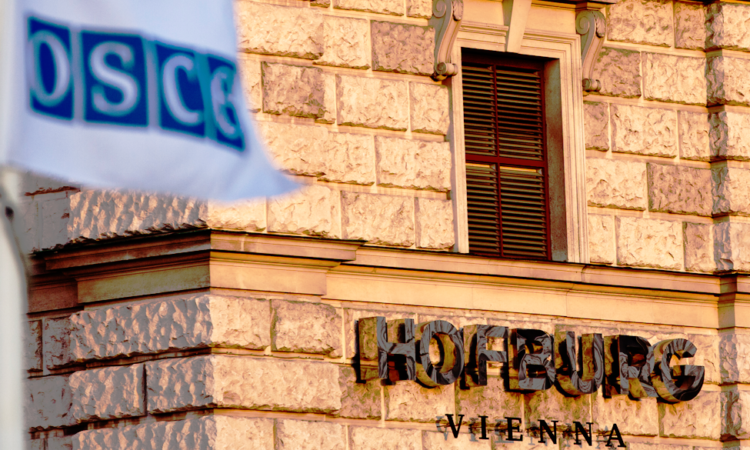 We note with great concern that the fighting fomented by Russian aggression in eastern Ukraine is again on the verge of causing a significant humanitarian disaster. 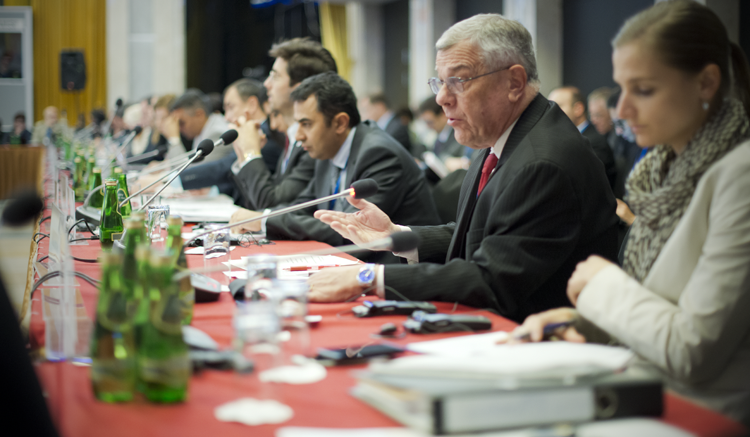 The Geneva International Discussions on the conflict in Georgia. 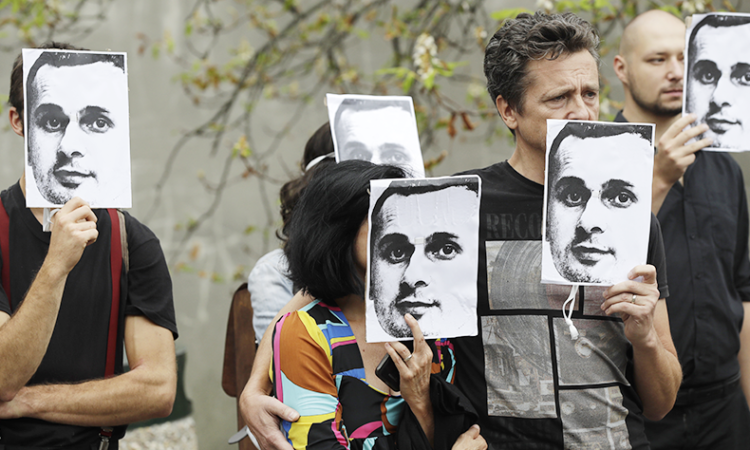 Ending impunity for crimes against journalists. 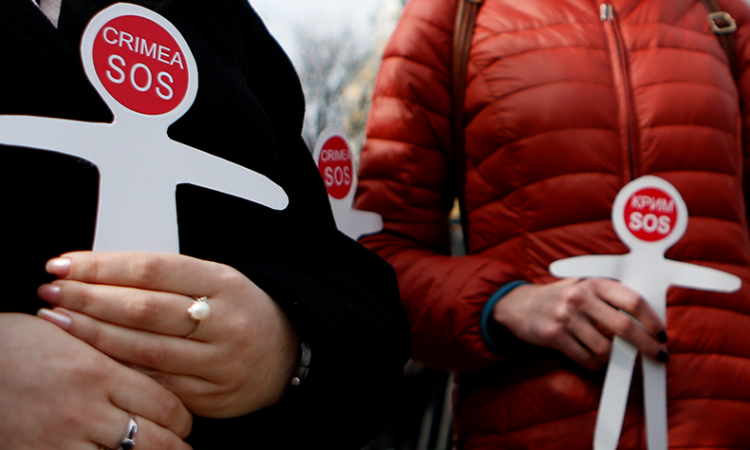 Russia's ongoing violations in Ukraine. 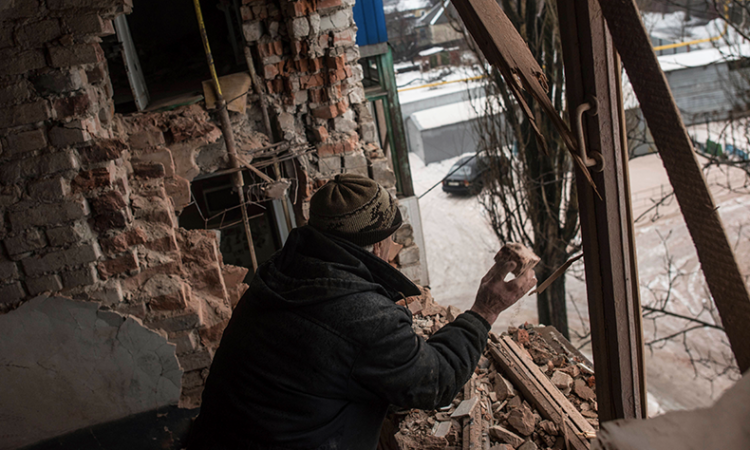 The so-called renewed “Back to School” ceasefire effort in eastern Ukraine appears to be collapsing. 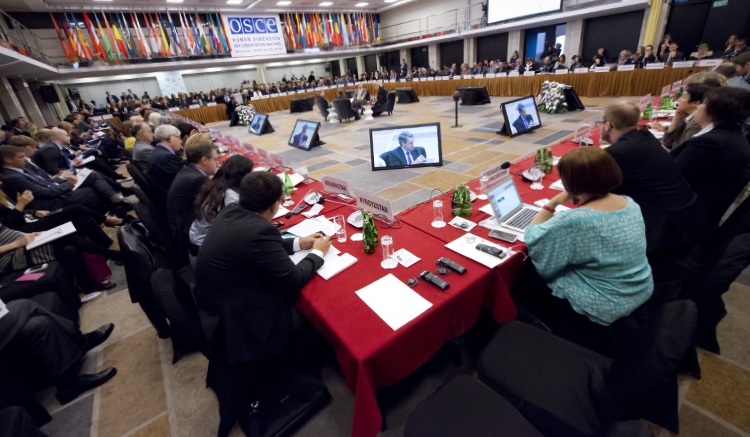 The OSCE's work on the environment, Russia's ongoing violations in Ukraine, security sector support in the migration crisis, and much more. 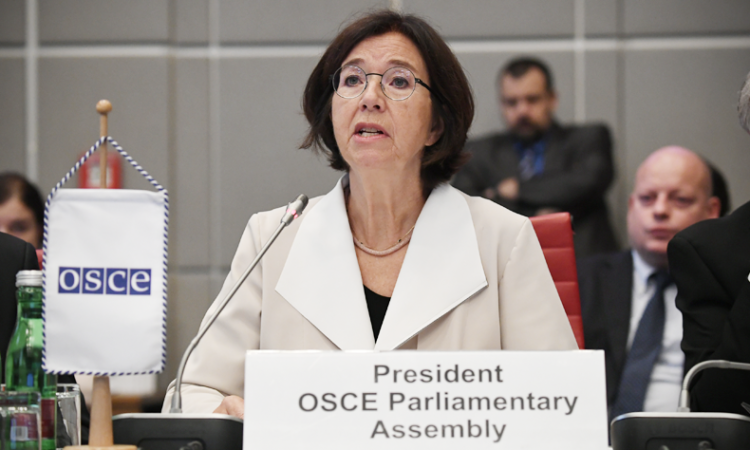 Response to President of the OSCE Parliamentary Assembly Christine Muttonen's address to the OSCE Permanent Council. 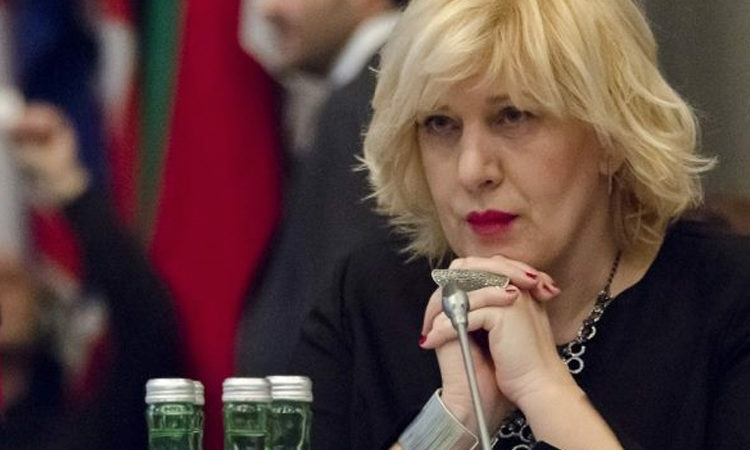 Macedonia's foreign minister addresses the delegations, Russia's ongoing violations in Ukraine, gay rights in Azerbaijan, and more. 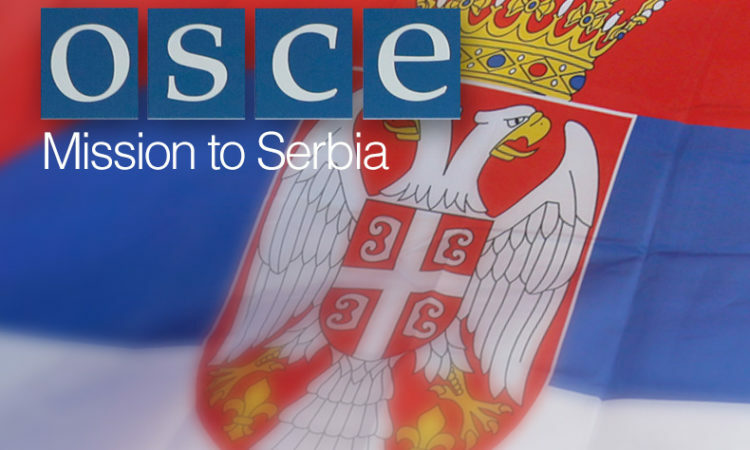 We call on Russia to disengage the forces it leads, arms, trains, and fights alongside from the line of contact and withdraw proscribed weapons in accordance with the Minsk agreements. 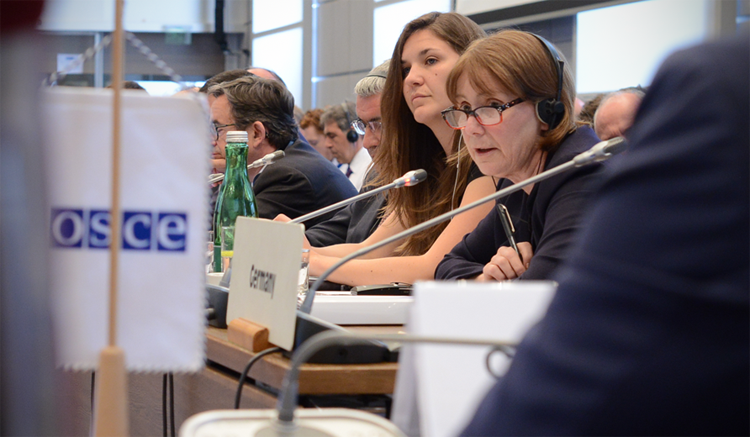 Christine Beerli of the International Red Cross (ICRC) addressed the OSCE Permanent Council. 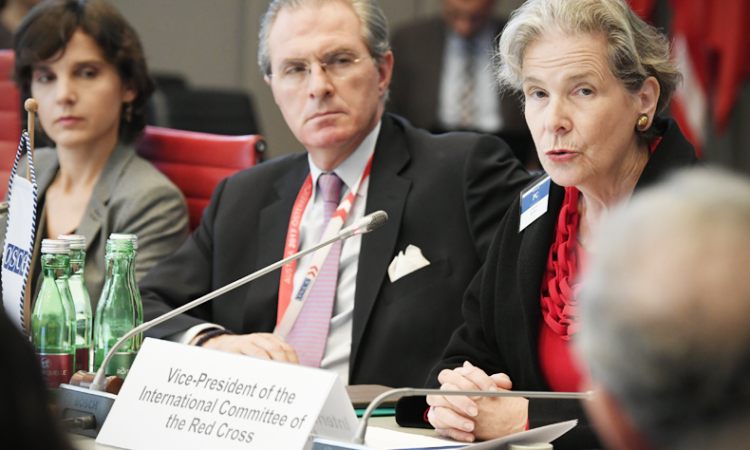 We responded on the crucial work the ICRC does in conflict-affected areas. 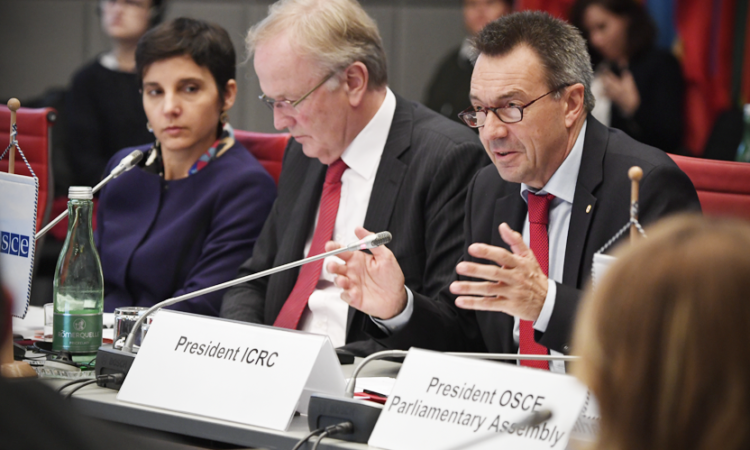 The role of women in peace processes, the shrinking space for civil society, the sentencing of Crimean Tatar leader Ilmi Umerov, and more. 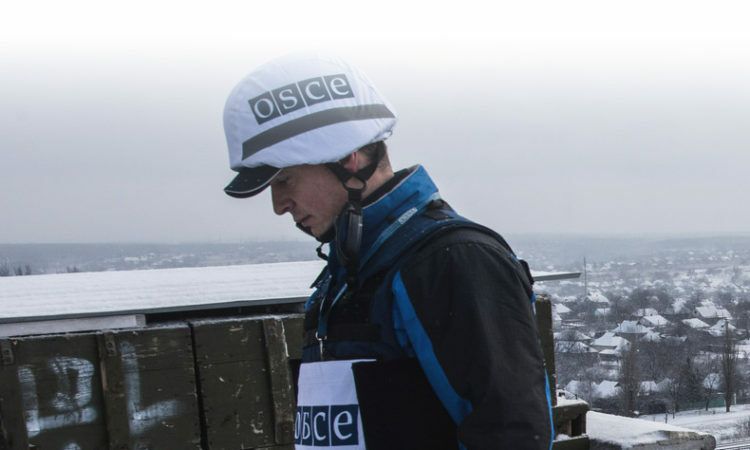 We again call on Russia to disengage the forces it leads, arms, trains, and fights alongside from the line of contact and withdraw proscribed weapons in accordance with the Minsk agreements. 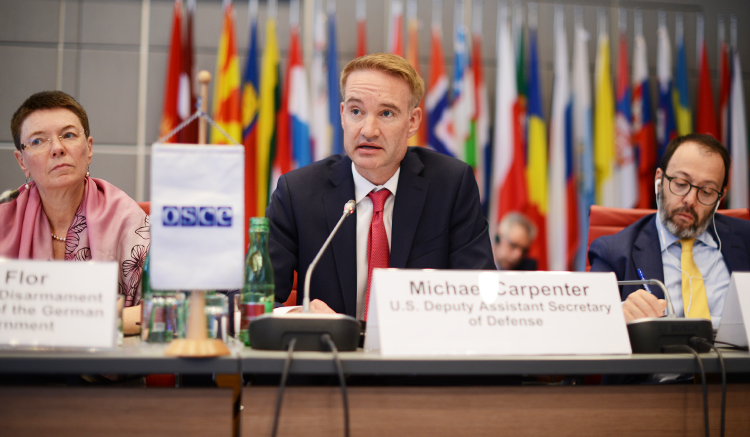 The United States does not recognize the legitimacy or the outcome of the elections that took place in Russian-occupied Crimea on September 10. 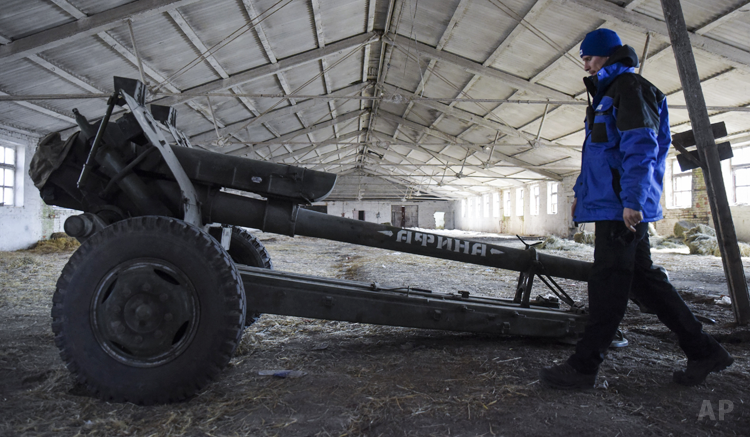 Reported ceasefire violations in Ukraine have decreased, but the use of heavy weapons violations still exceeds 100 per week. 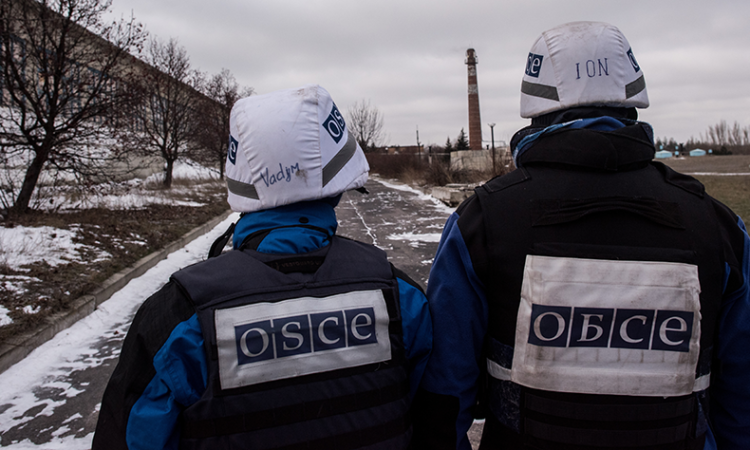 OSCE monitors in Ukraine continue to face serious restrictions, violence, and harassment in territory controlled by the forces Russia arms, trains, leads and fights alongside. 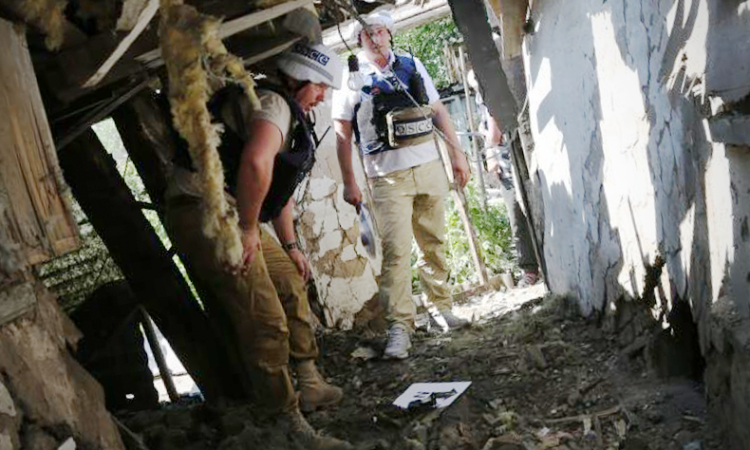 The investigations into the April 23 tragedy resulting in the death of SMM paramedic Joseph Stone must be honest, thorough, and transparent, and include concrete determinations on making SMM operations stronger and safer in the future. 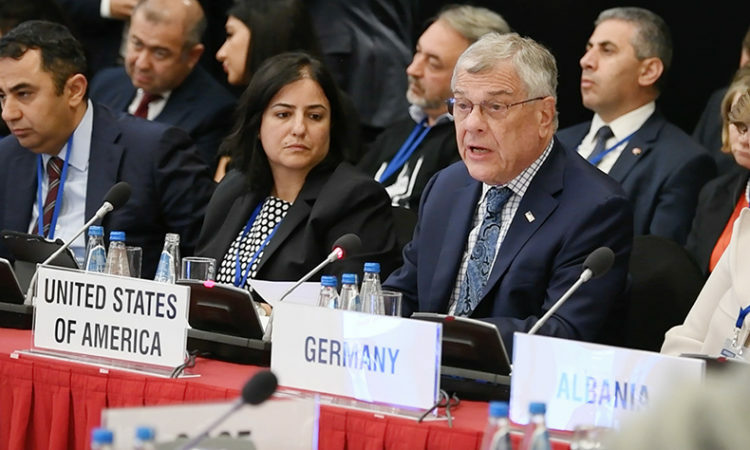 Because Russia continues to block the Observer Mission's expansion -- despite clear, strong, continued support from other participating States to do so -- we once again are forced to accept a limited and inadequate mission. 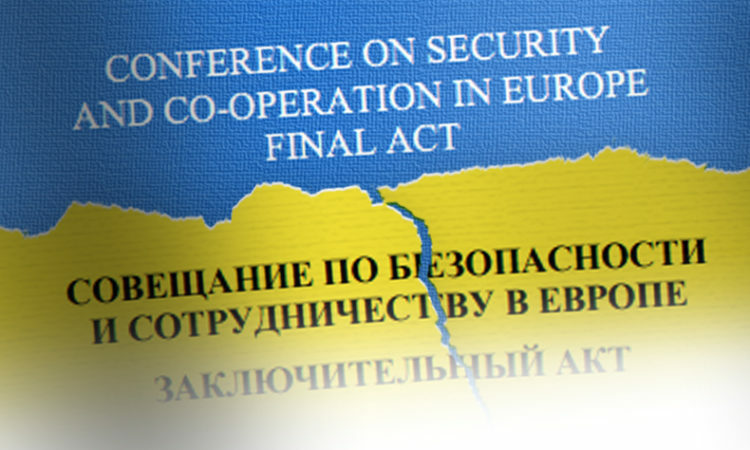 A genuine and lasting ceasefire, followed by the withdrawal of proscribed weapons, is required before work begins on the political aspects of the Minsk agreements. 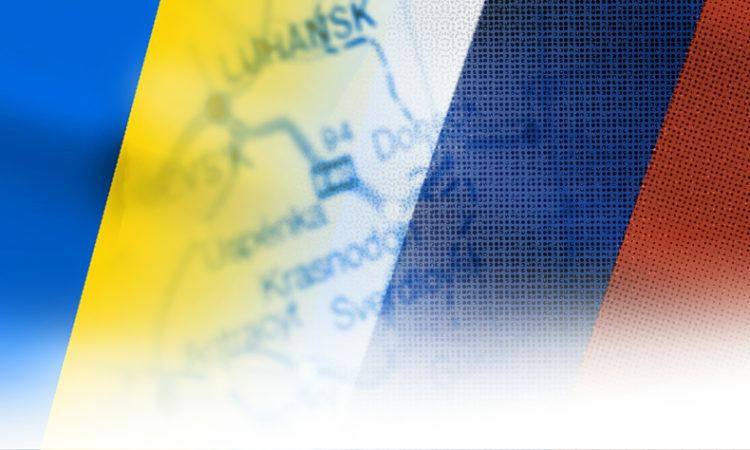 The Project Coordinator in Ukraine (PCU) plays an indispensable role in providing assistance to Ukraine. 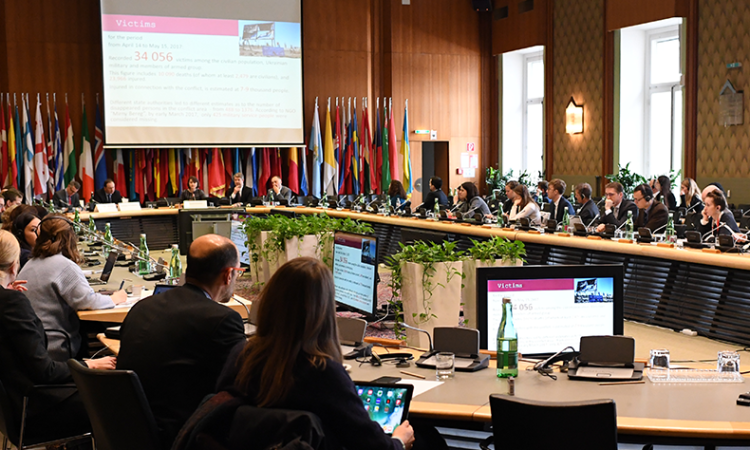 Key projects offer training on psychological support to people in conflict-affected areas; advocate for humanitarian demining; promote the safety of journalists; and support policy recommendations that draw attention to the plight of displaced persons. 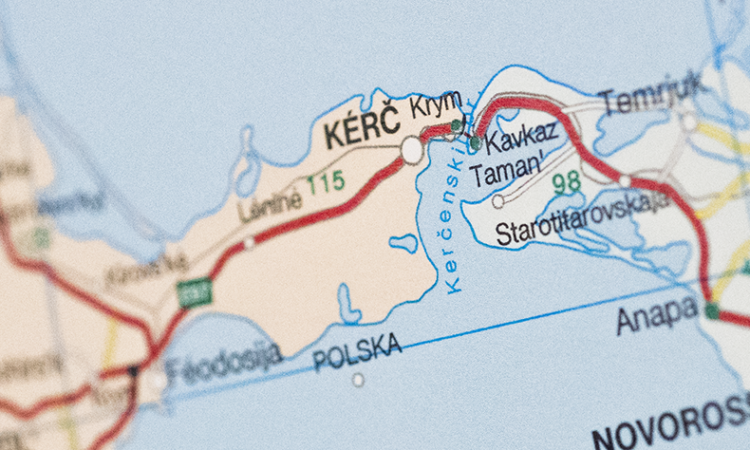 The United States notes that Crimea remains an integral and internationally-recognized part of Ukraine, despite Russia’s ongoing occupation and attempted annexation. 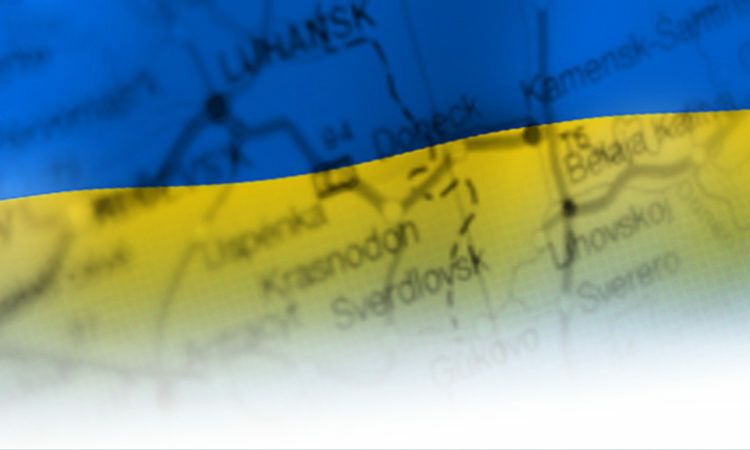 The mandate of the Project Coordinator in Ukraine applies to the entire country of Ukraine, including Crimea. 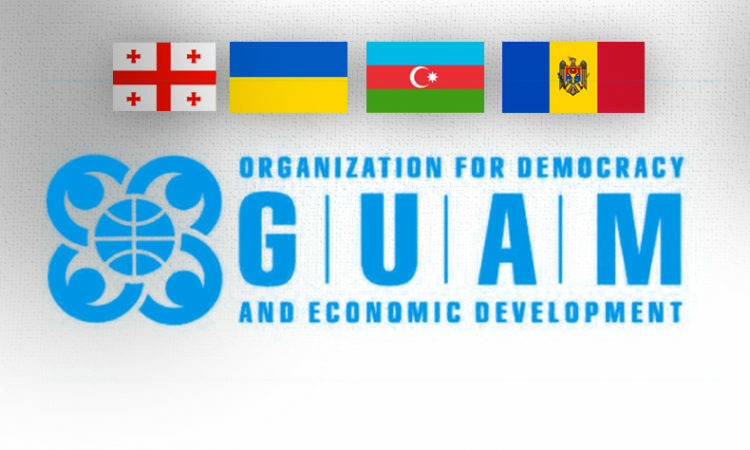 We share the concerns of Organization for Democracy and Economic Development member states about the active and protracted conflicts in this region, and are deeply concerned by continuing violations of member states’ sovereignty and territorial integrity. 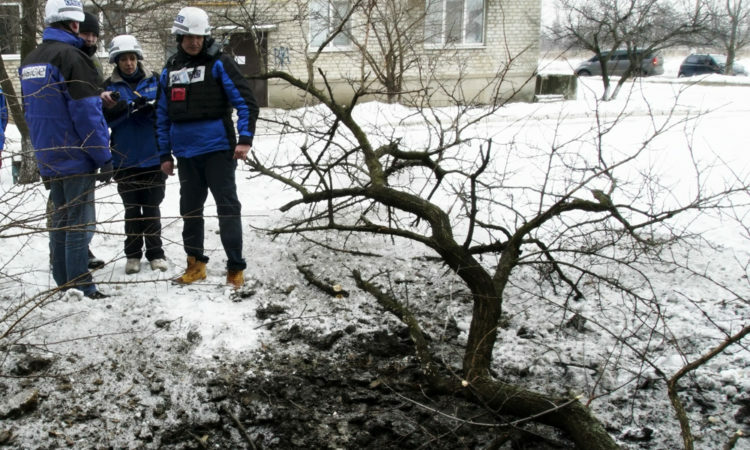 Within 30 meters of a hospital, there was a shell crater four meters in diameter and two meters deep, assessed to have been fired from a 152mm artillery piece located in “separatist”-controlled territory. Because a shell of this size will generally kill anything within 50 meters of impact, it caused extensive damage to the hospital. 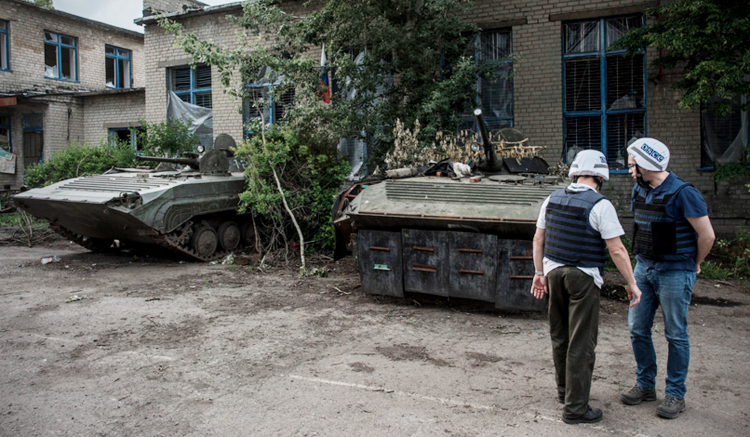 The conflict in eastern Ukraine continues unabated. 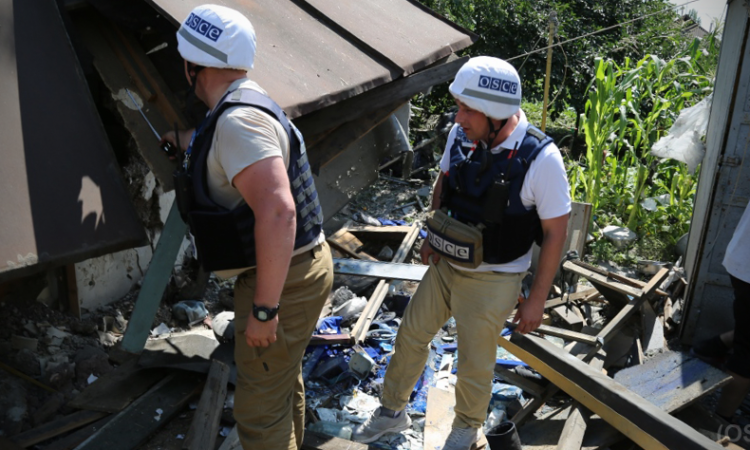 On May 17, the SMM noted a 75 percent increase in ceasefire violations compared to the previous week, heightened violence in all five major hotspots along the contact line, and mounting civilian deaths. 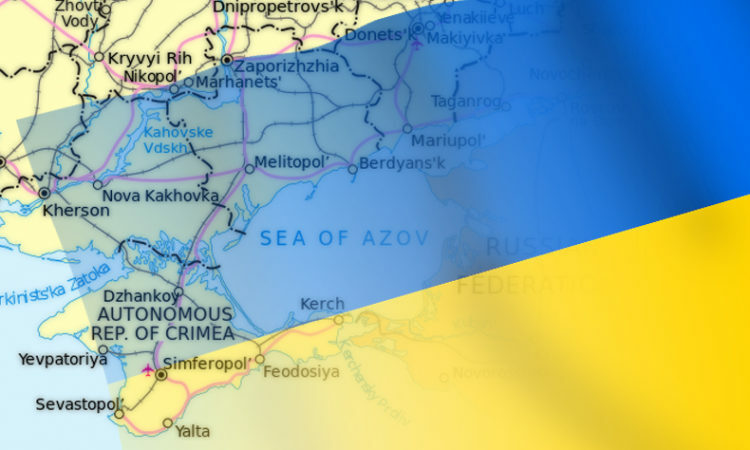 Russia’s aggression against Ukraine has shaken the very foundations of security and stability in Europe, and is antithetical to a vision of Europe that is whole, free, and at peace. 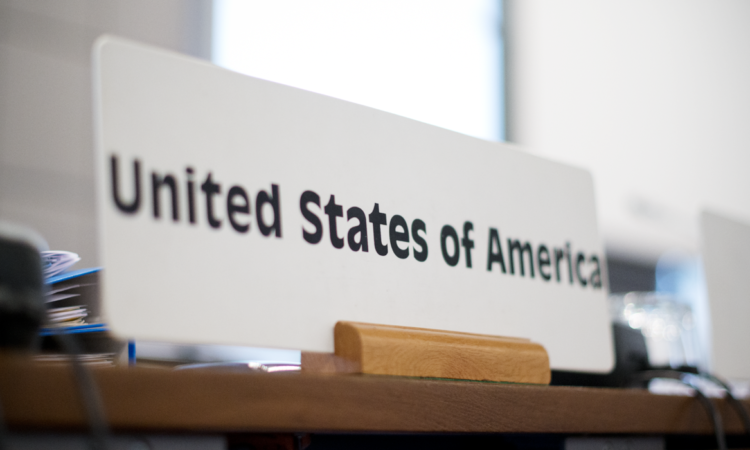 The United States affirms its staunch support for Ukraine’s sovereignty, independence, and territorial integrity within its internationally-recognized borders. 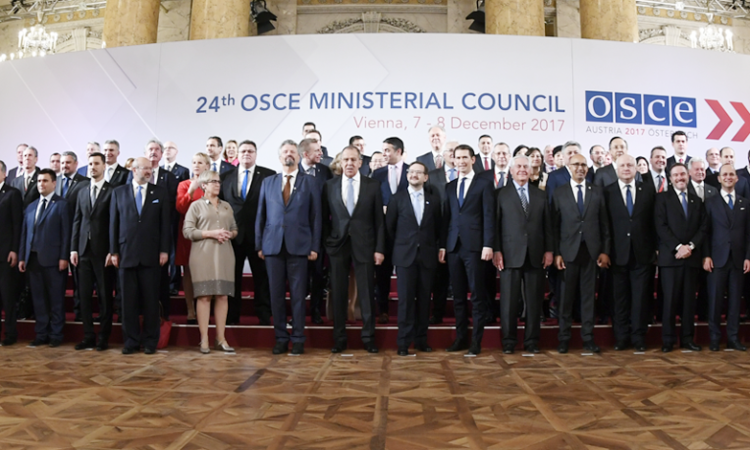 Only a visible, verifiable, and irreversible improvement in the security situation will allow progress on the Minsk agreements, starting with a real and sustainable ceasefire, disengagement of forces, and the withdrawal of heavy weapons. 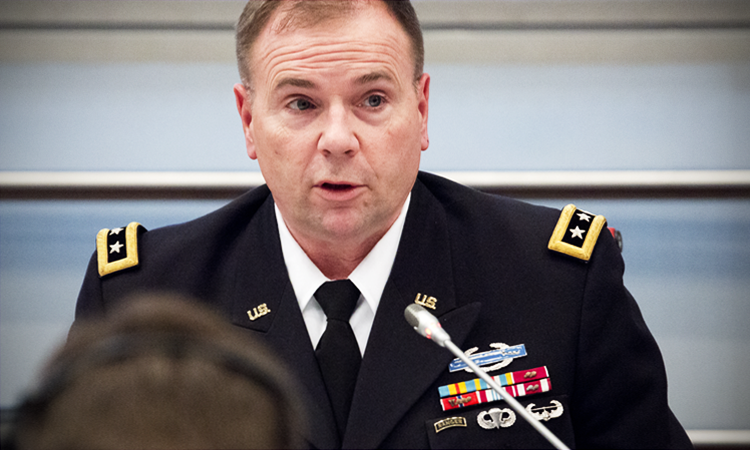 Yet Russia continues a pattern of behavior that undermines disengagement. 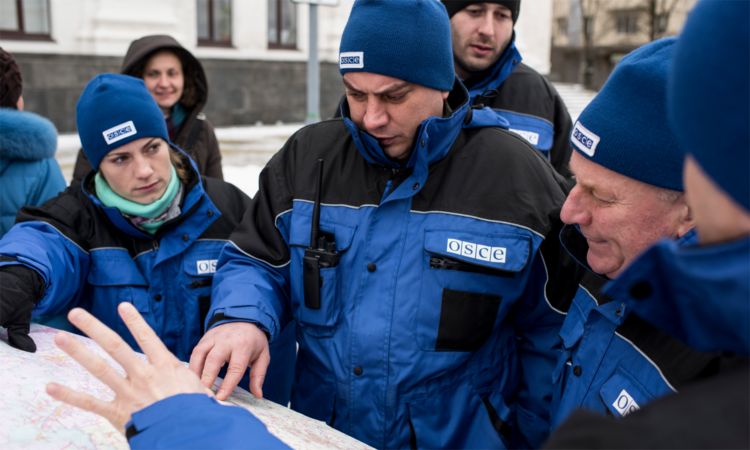 OSCE observers at Gukovo and Donetsk are critical to supporting the work of the Special Monitoring Mission to Ukraine (SMM), which is also restricted while patrolling in so-called “separatist”-held territory within Ukraine. 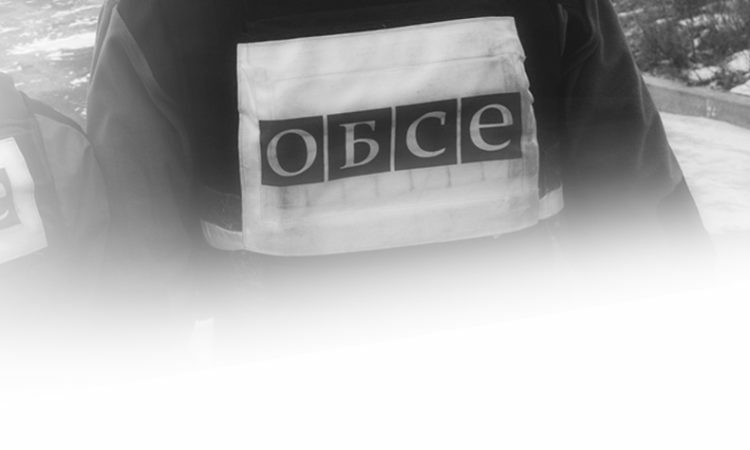 The United States is shocked and deeply saddened by the death of Joseph Stone, a U.S. citizen serving as a paramedic with OSCE Special Monitoring Mission (SMM), when his vehicle struck an explosive in separatist controlled territory in eastern Ukraine. Colleagues, we must not allow ourselves to fall into the trap of moral equivalency. 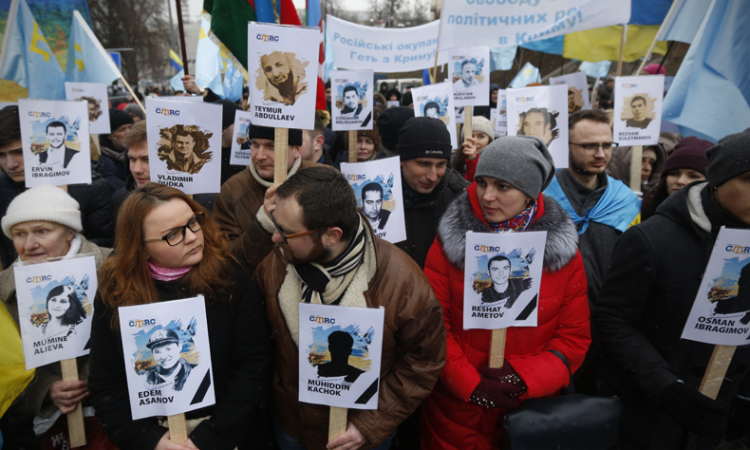 Ukraine is defending itself against a campaign of aggression by Russia. 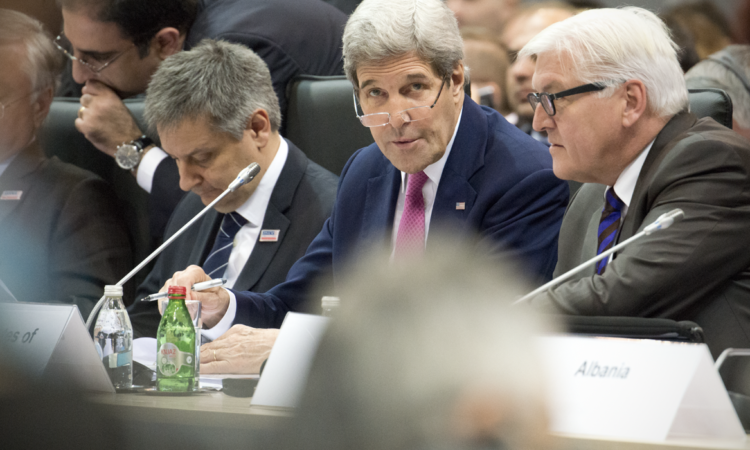 Russian aggression in eastern Ukraine continues to cost lives every day. 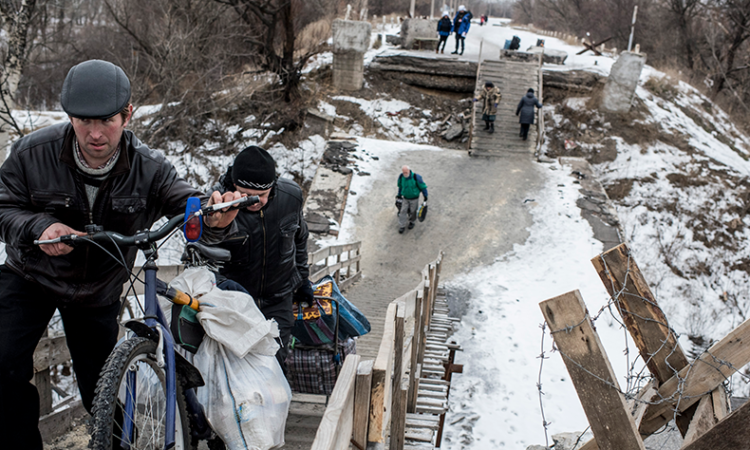 More than a million people remain displaced by fighting. 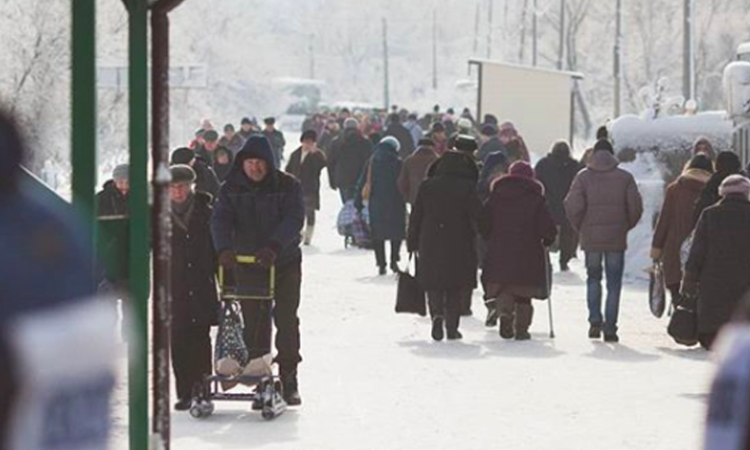 The humanitarian crisis has worsened, as shelling periodically cuts off water and power to people living in the Donbas. The economy has been severely damaged. 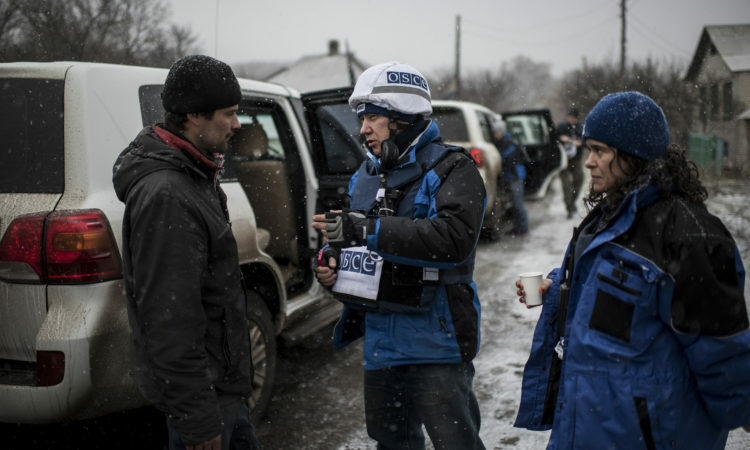 And OSCE monitors continue to face restrictions, harassment, and aggression. 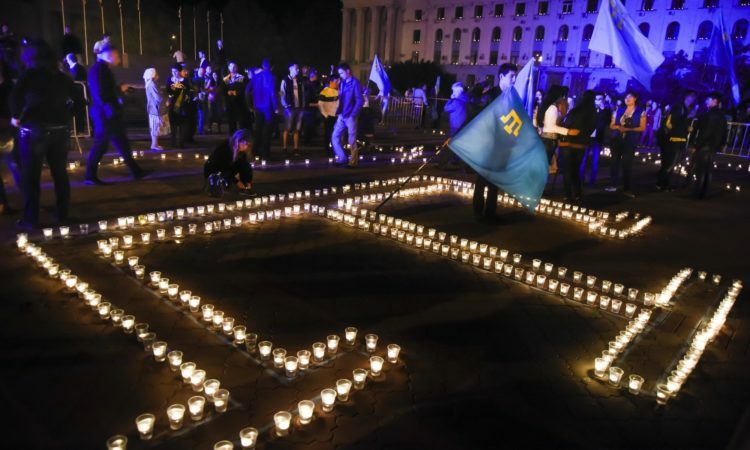 Three years have passed since Russia launched its occupation and attempted annexation of Crimea. 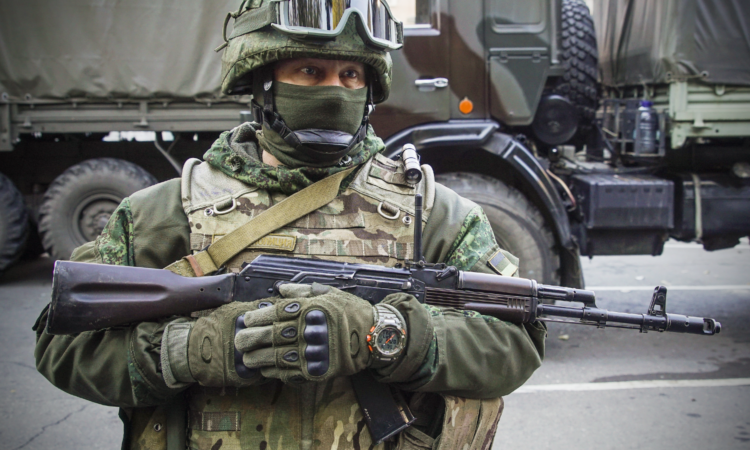 On February 27, 2014, Russian troops in unmarked uniforms seized the parliament building in Simferopol, and then proceeded to hold Crimea hostage until Russia forced the illegitimate “referendum” on March 16. 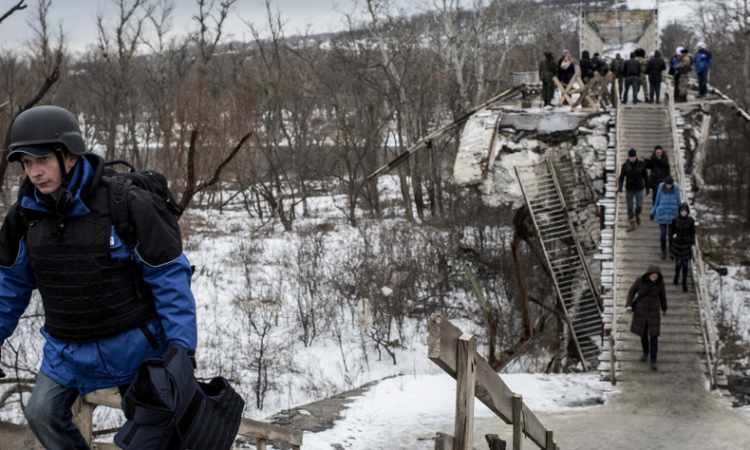 The United States is deeply concerned about the increasing risk to civilians in eastern Ukraine. 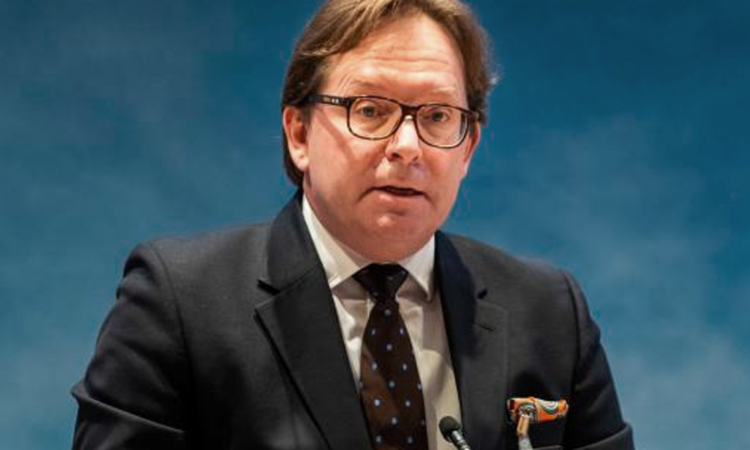 Last week, the United Nations confirmed that fighting had claimed the lives of at least 20 civilians since the start of the year, and wounded over 91 more. 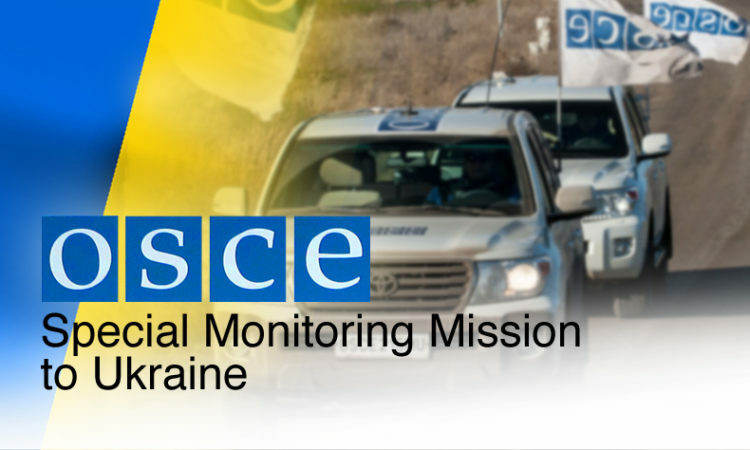 The United States welcomes the extension of the mandate of the OSCE Special Monitoring Mission to Ukraine. 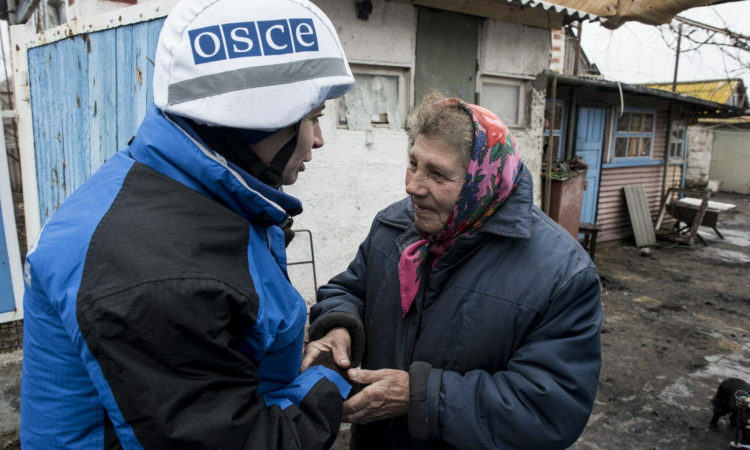 The unrelenting violence calls into question the commitment made by Russia and the separatists to the ceasefire. 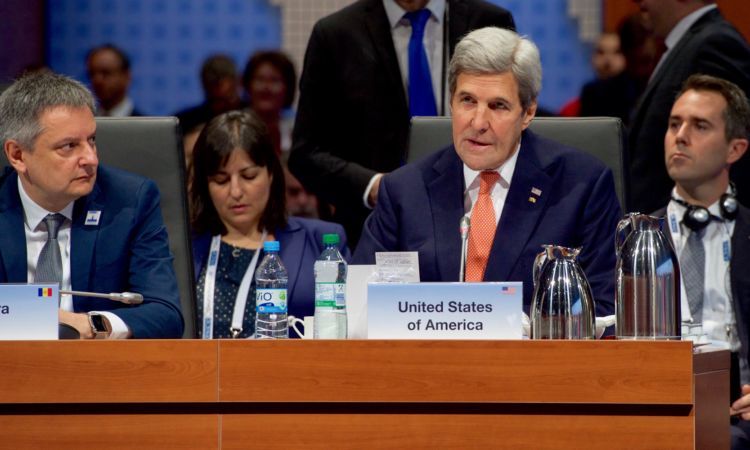 The United States remains deeply concerned about the volatile security situation in eastern Ukraine. 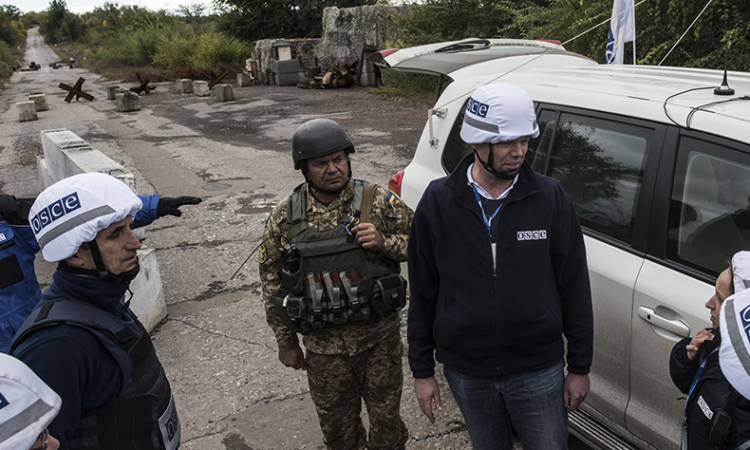 The OSCE is playing a crucial role observing and monitoring the situation in eastern Ukraine. 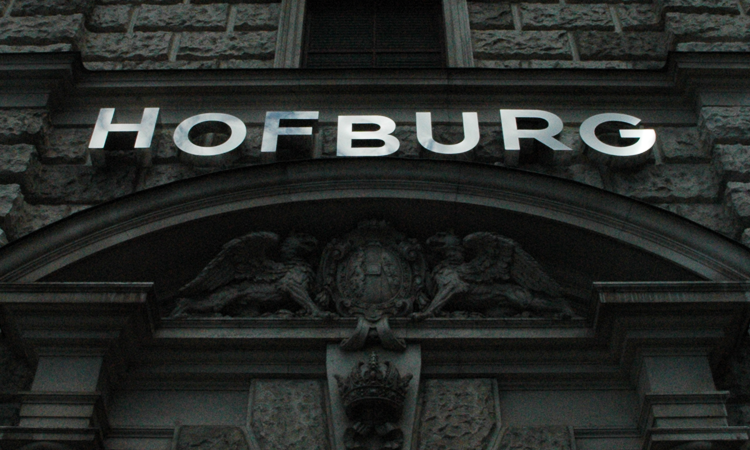 U.S. bonds with NATO and the OSCE have stood the test of time. 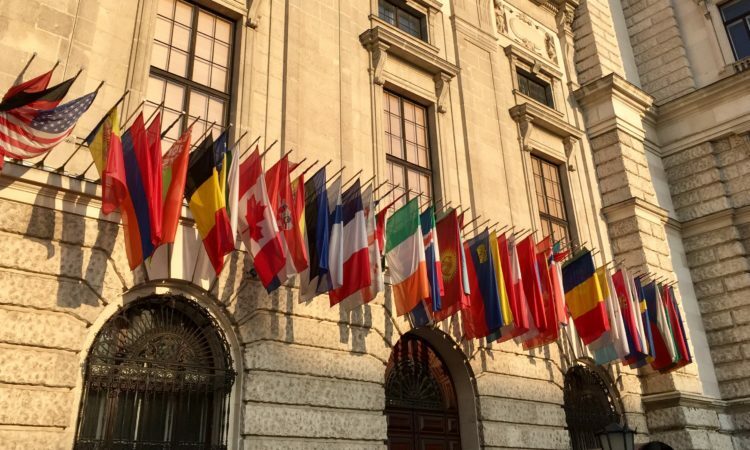 These are institutions that bring together partners on both sides of the Atlantic Ocean to defend our shared ideals. 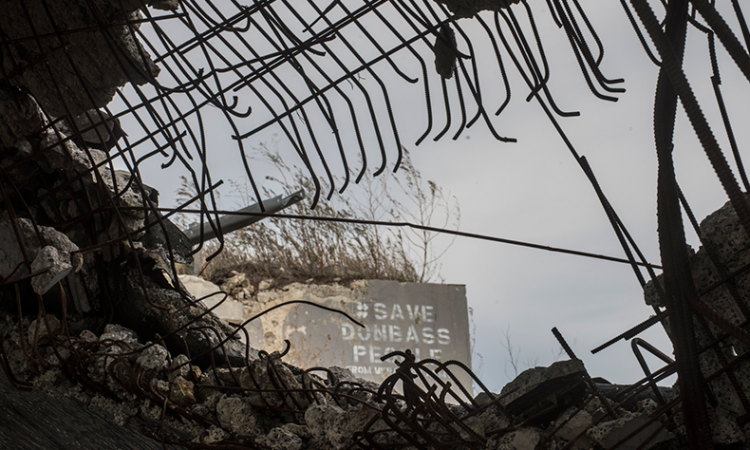 A renewed commitment to a full and lasting ceasefire is urgently needed to protect civilians and critical infrastructure. 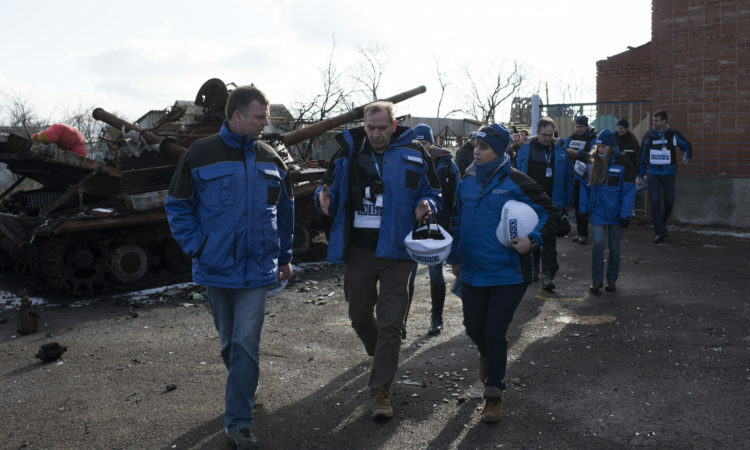 The United States applauds the heroic work of the Special Monitoring Mission to Ukraine in brokering the local ceasefires in Avdiyivka that allowed essential repairs to restore power, water, and heating to tens of thousands of people living on both sides of the contact line. Yet the situation remains volatile. 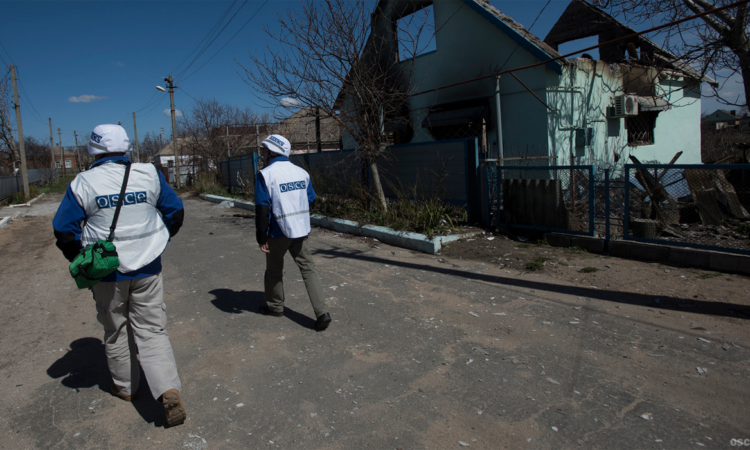 We are particularly concerned that fighting continues unchecked in Avdiivka, despite efforts by Ukrainian authorities to end the violence. 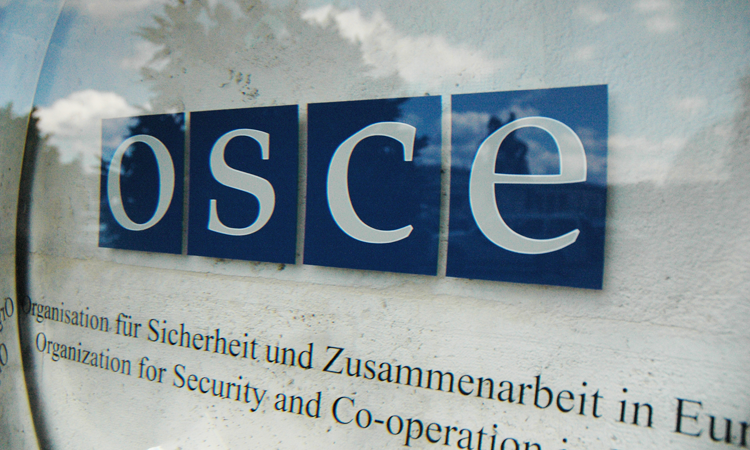 [...] Colleagues, there can be no confidence in the ceasefire if the OSCE Special Monitoring Mission is unable to verify it. 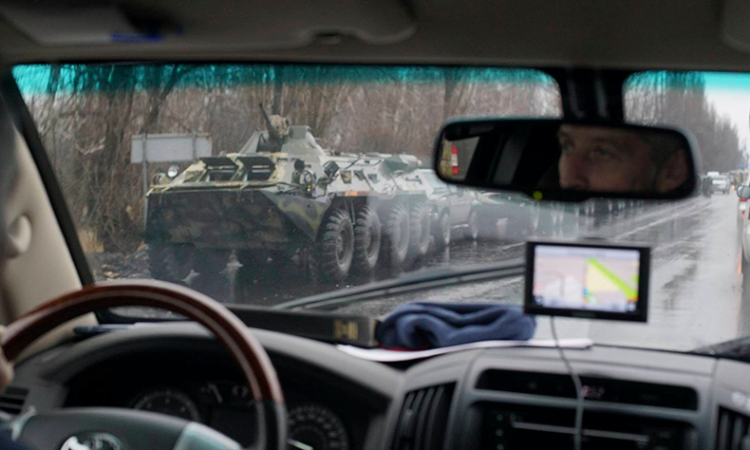 On January 26, Russia warned that the risk of military escalation in eastern Ukraine was great. Two days later, fighting escalated significantly. 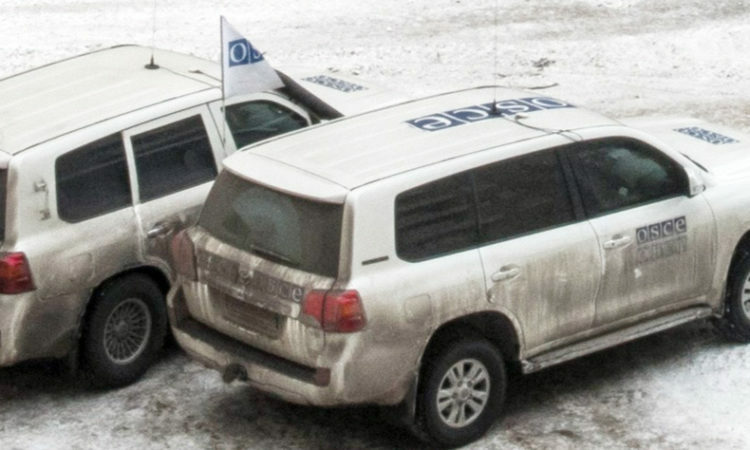 We value greatly the important work carried out by the OSCE field missions in Uzbekistan and Kyrgyzstan, and the Observer Mission on the Russian-Ukrainian border. 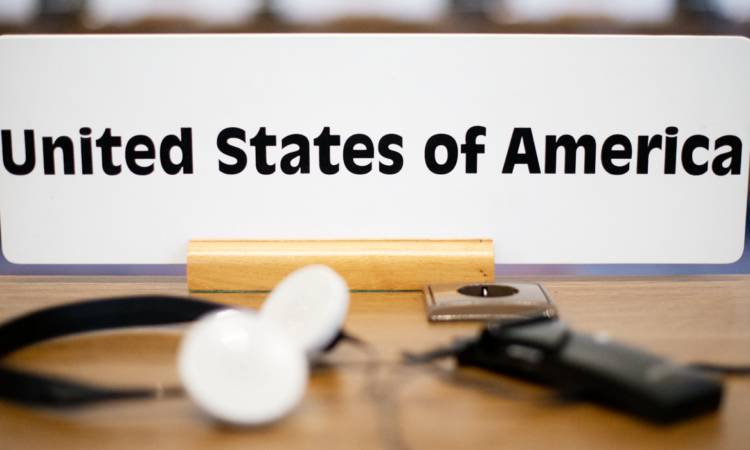 The United States finds it deeply regrettable that the Russian Federation continues to block the expansion of the geographic scope of the Observer Mission, despite the clear, strong, and continued support from other participating States to do so. 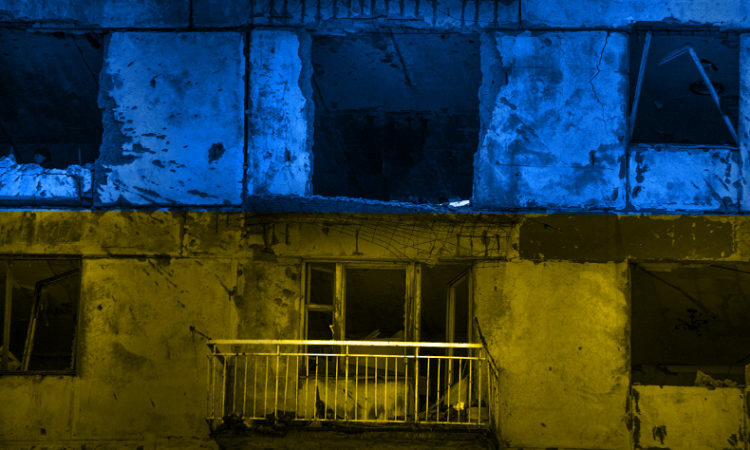 This conflict will remain volatile until weapons proscribed by the Minsk agreements are withdrawn, and the framework decisions on disengagement and demining are fully implemented. 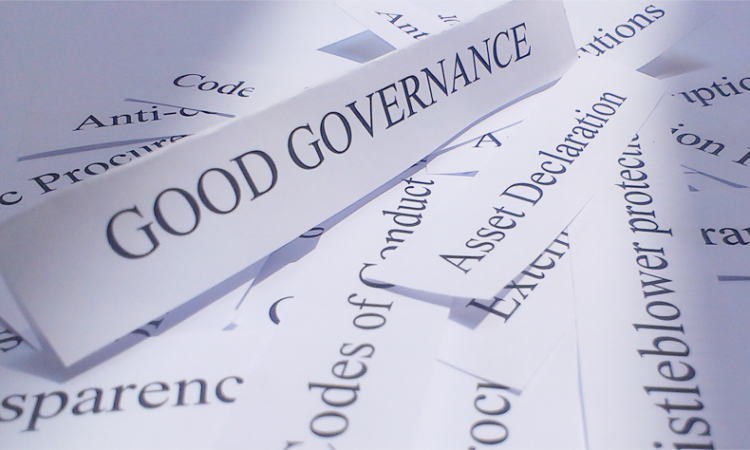 Otherwise, there is little to stop small-scale clashes from escalating, and this conflict from continuing. 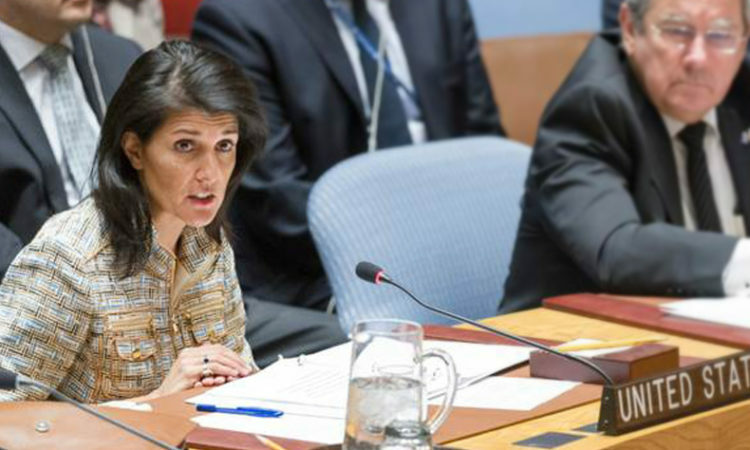 "[A]s we heard again this morning, Russia refuses to take responsibility for starting this conflict and continues to lie about its ongoing role in the fighting." 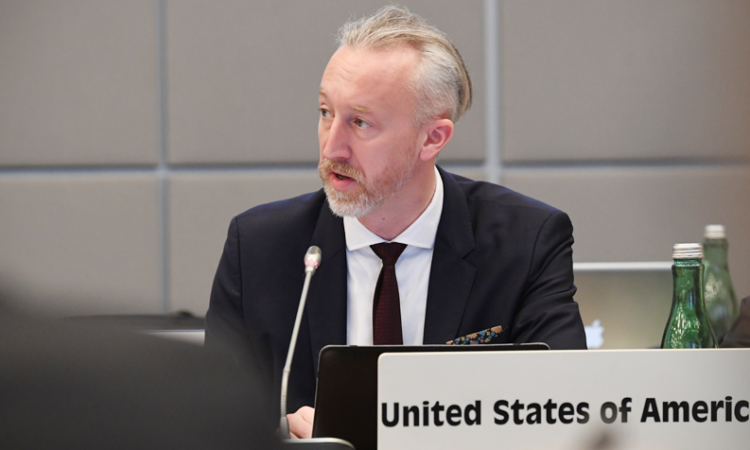 The United States looks to Austria to maintain the German Chairmanship’s principled focus on supporting civil society and independent media, and promoting tolerance and non-discrimination throughout the OSCE region. 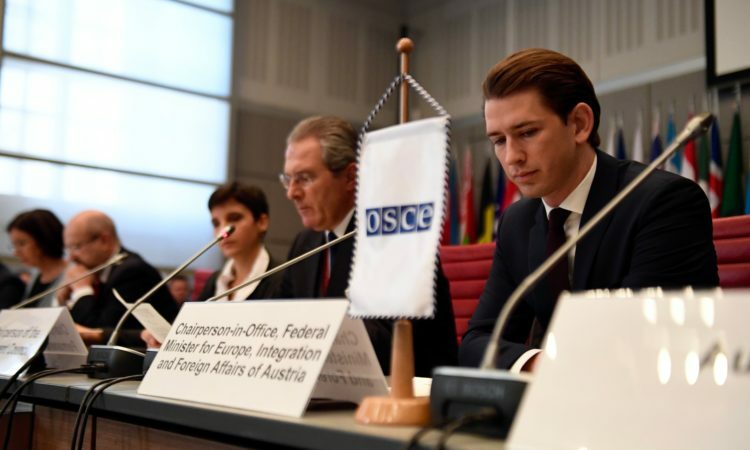 The failures of participating States to implement their OSCE commitments do not make the fundamental truth underlying the OSCE concept of comprehensive security any less true. 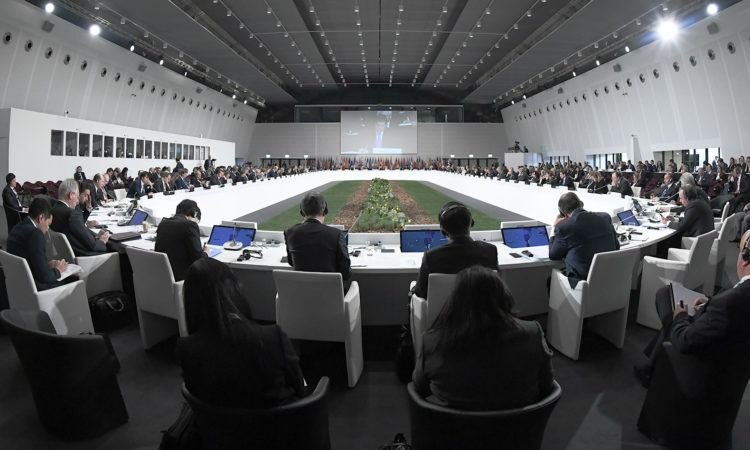 Friends and colleagues, we meet in Hamburg today to reaffirm the same idea that tied us together in Helsinki 41 years ago: that our collective security is directly linked to the growth of our economies and the protection of basic human rights. 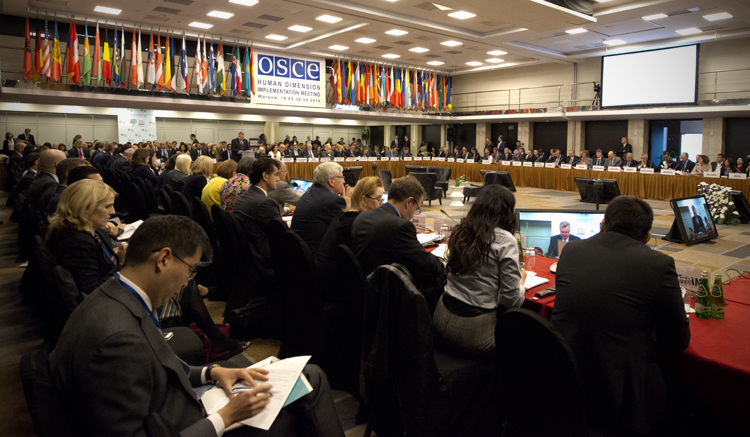 Russia has refused to enable the Observer Mission to fully discharge its mandate. 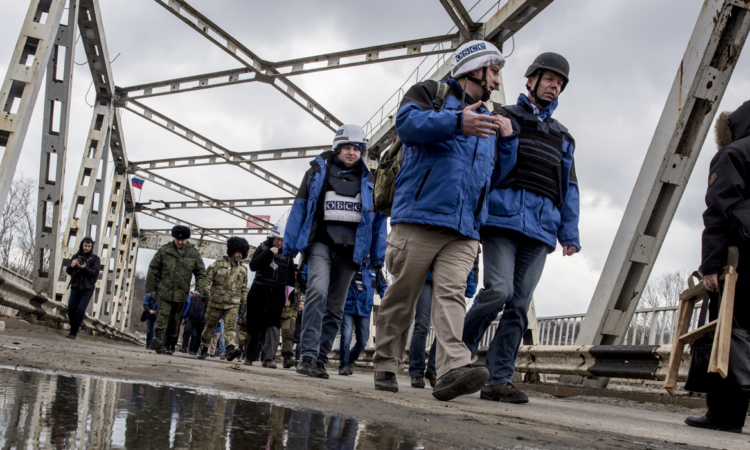 We are deeply concerned about the recent uptick in violence in eastern Ukraine, which includes the use of heavy artillery and multiple-launch rocket systems. 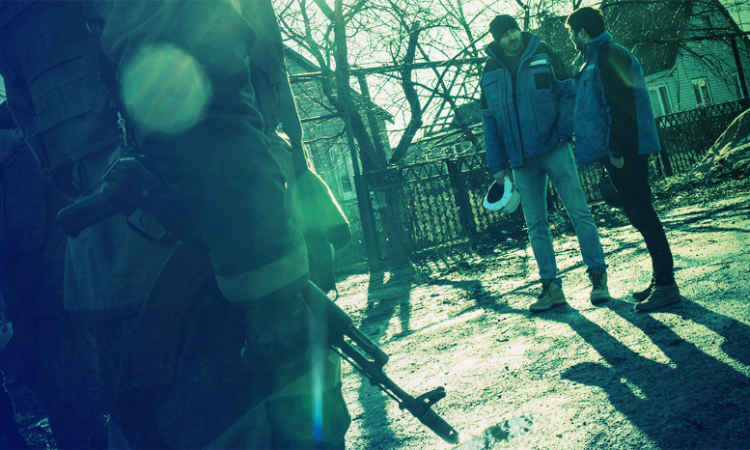 The fighting in eastern Ukraine has recently escalated, where the “school year” ceasefire appears to be unraveling. 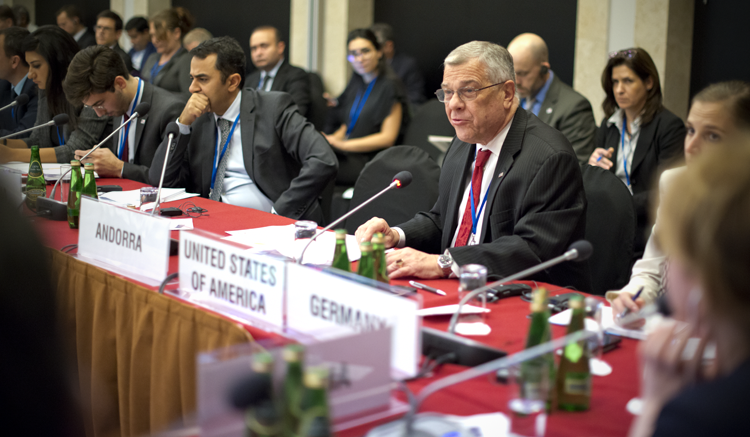 The U.S. highly values the work of the Parliamentary Assembly, and the contribution that parliamentarians make to our common goals and objectives for the OSCE region. 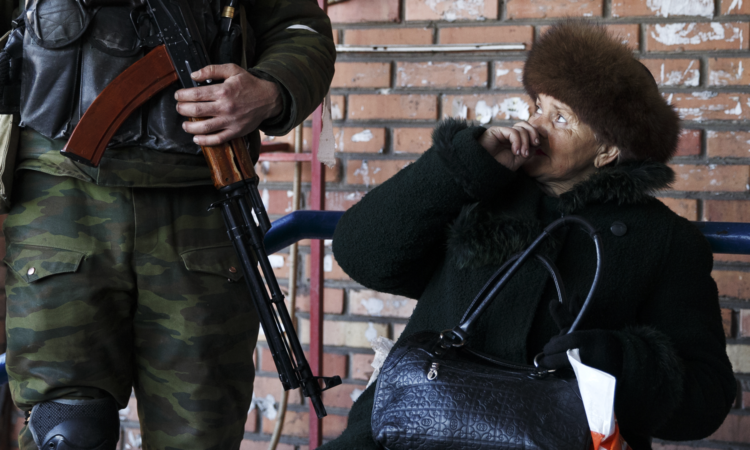 Russia’s unwarranted restrictions mean observers are unable to ascertain the full extent of Russian support for the separatists in eastern Ukraine. 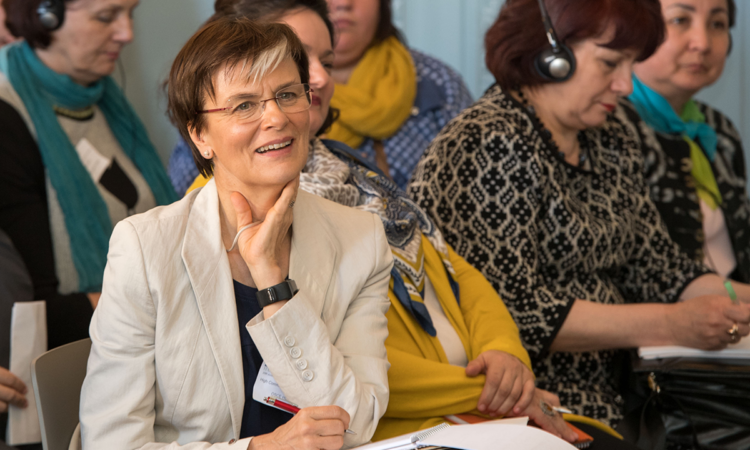 Freedom of religion or belief is a founding principle of the Helsinki Process. 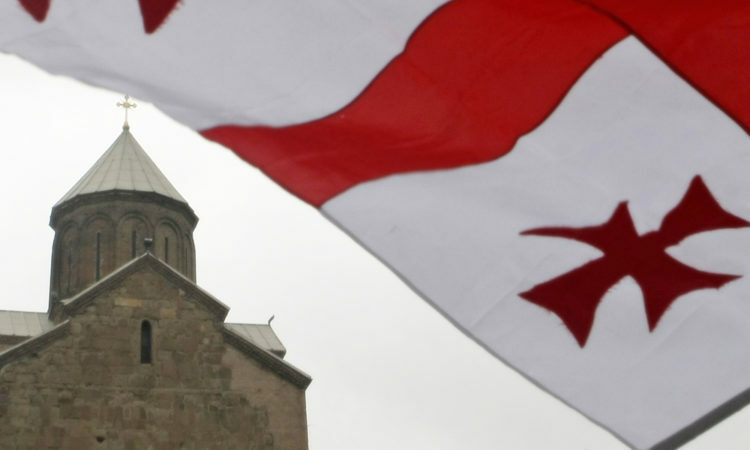 Unfortunately, a small number of participating States engage in consistent, systematic violations and abuses of the freedom of religion or belief. 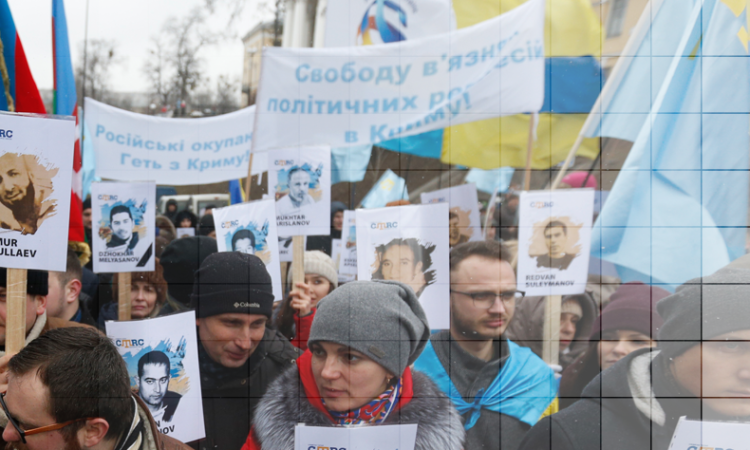 In many participating States, the exercise of peaceful assembly and association is subject to undue and serious restrictions. 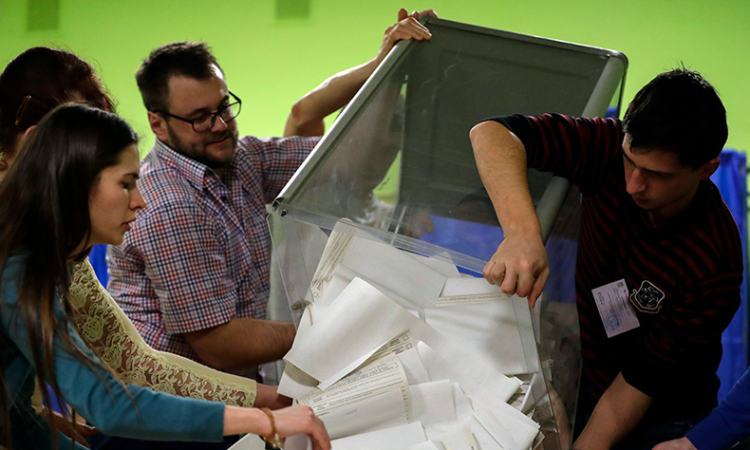 Elections are an essential element of democracy and a cornerstone of democratic institutions. 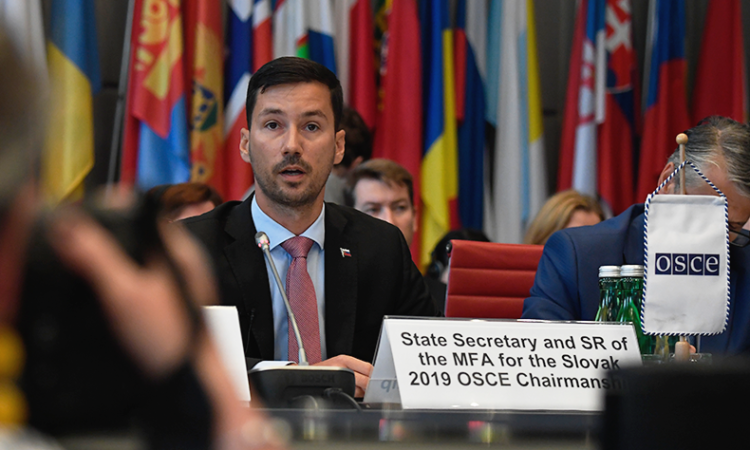 The U.S. greatly appreciates the OSCE’s invaluable role in election observation – indeed, this organization has developed what is known as the “gold standard” for its methodology on evaluating elections. 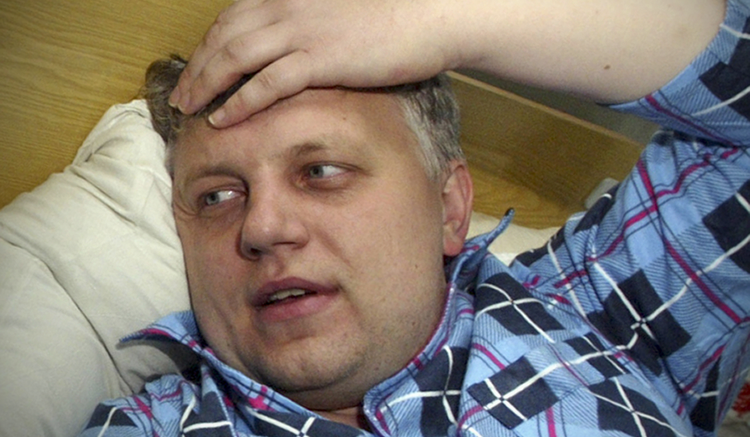 The United States was shocked and saddened by the news of the killing of prominent journalist Pavel Sheremet in a car explosion in Kyiv, Ukraine. 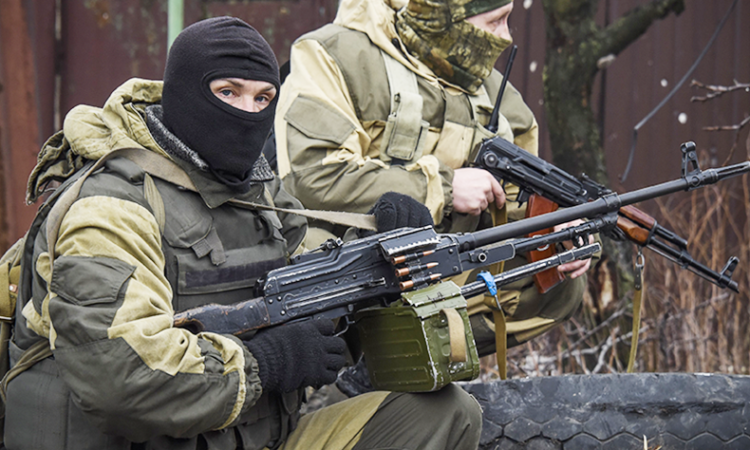 The buildup of Russian heavy weapons and personnel in eastern Ukraine continues. 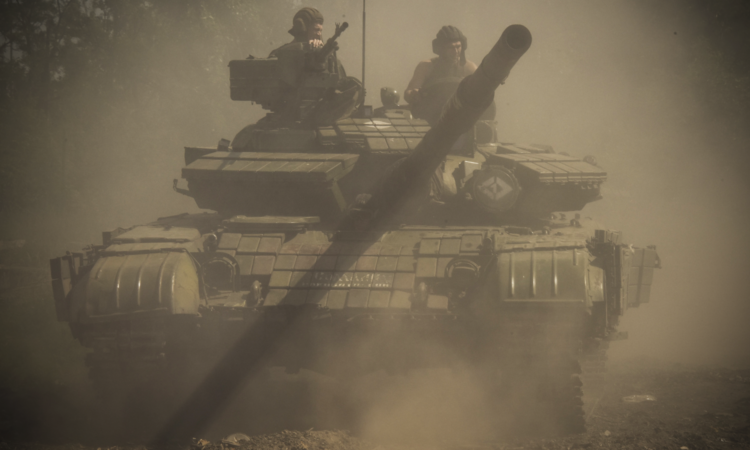 Over the past week, Ukraine’s armed forces suffered the most casualties in any one-week period since the September 2015 ceasefire was signed. 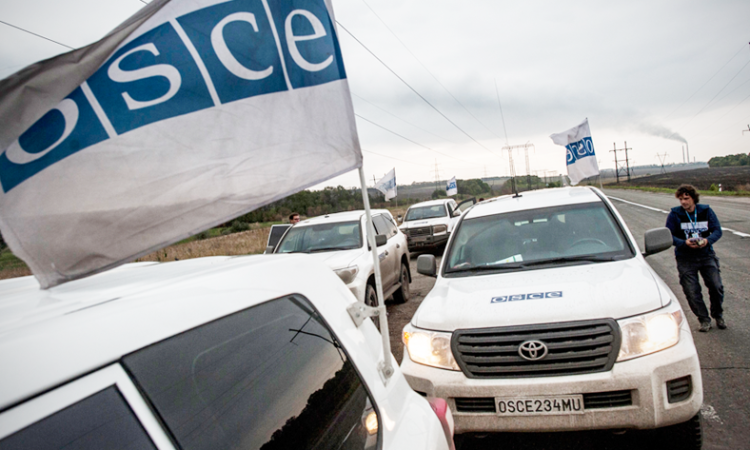 Russia and the separatists perpetuate a high level of violence that harms the civilian population in eastern Ukraine and threatens OSCE monitors. 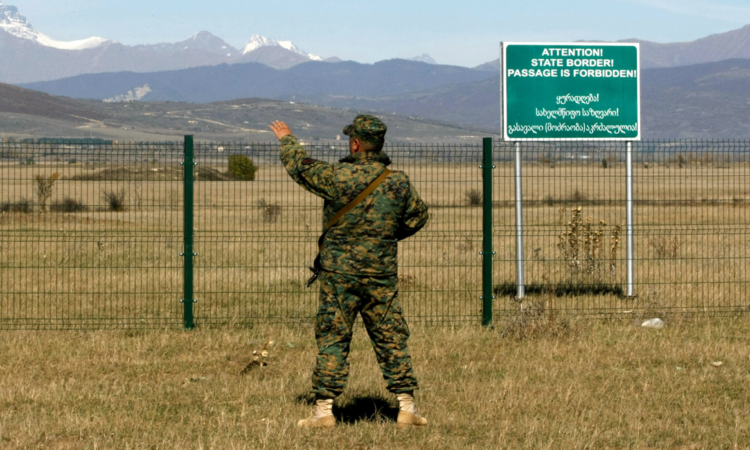 It has become all too common for some to speak of a “crisis in European security,” which is really an inadequate way to refer to Russia’s occupation and attempted annexation of Crimea, and Russian aggression in eastern Ukraine. 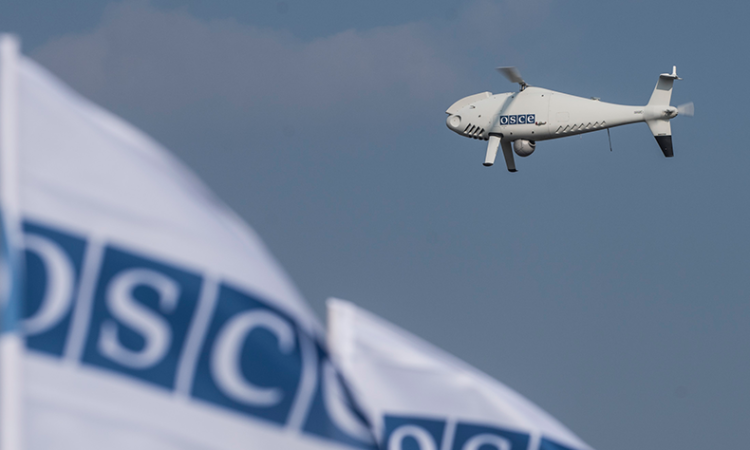 Due to Russia’s unwarranted restrictions of the border Observer Mission’s work, the Mission will continue to be unable to ascertain the full extent to which Russia is participating in or facilitating the flow of arms, funding, and personnel to support the separatists in eastern Ukraine. 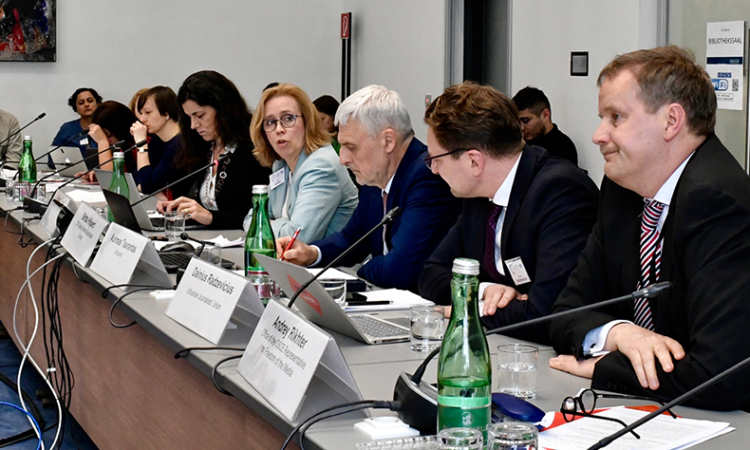 We urge the Government of Ukraine to work closely with the Project Coordinator to maximize its contributions to the fight against corruption. 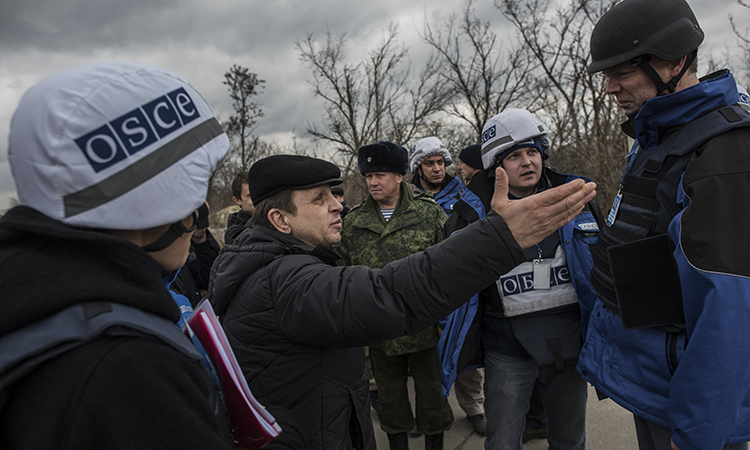 The conflicts in the South Caucasus and Moldova continue to stunt human potential and damage lives. The fact that they persist is a stain on our record as a community of nations. 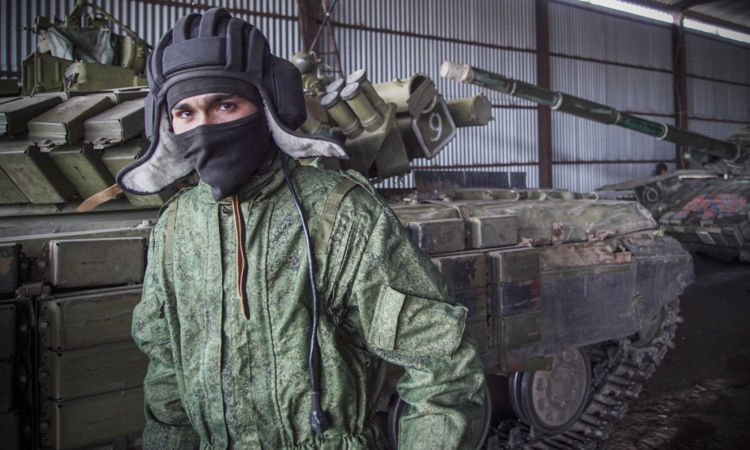 Russia claims that the conflict in eastern Ukraine is “internal,” but continues to supply personnel and equipment to combined-Russian-separatist military forces in Donbas. 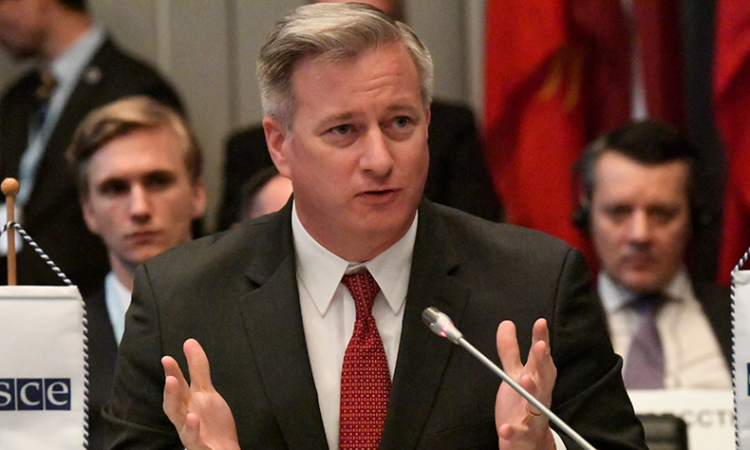 The United States remains deeply concerned by the surge in violence in eastern Ukraine and efforts by combined Russian-separatist forces to mask their increasing aggression and the weaponry that facilitates their attacks. 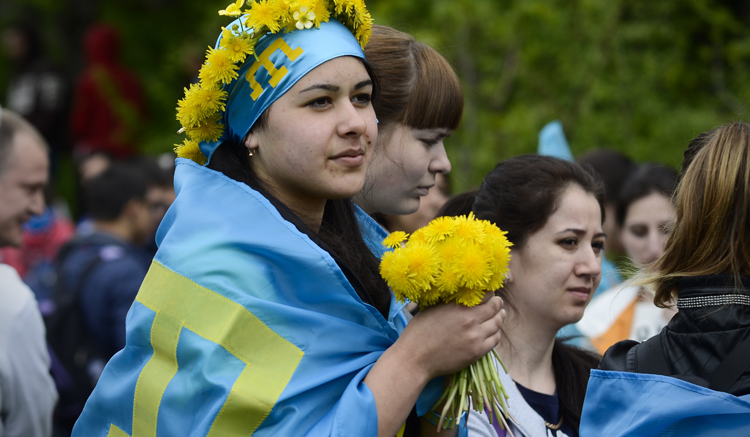 On May 18, 1944, the Soviet government ordered the mass deportation of over 230,000 Crimean Tatars from their homeland. 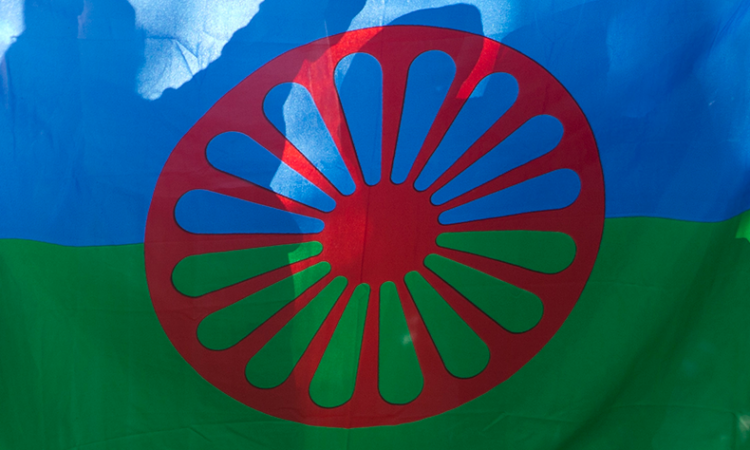 Nearly half of those deported, mostly women and children, perished between 1944 and 1947. 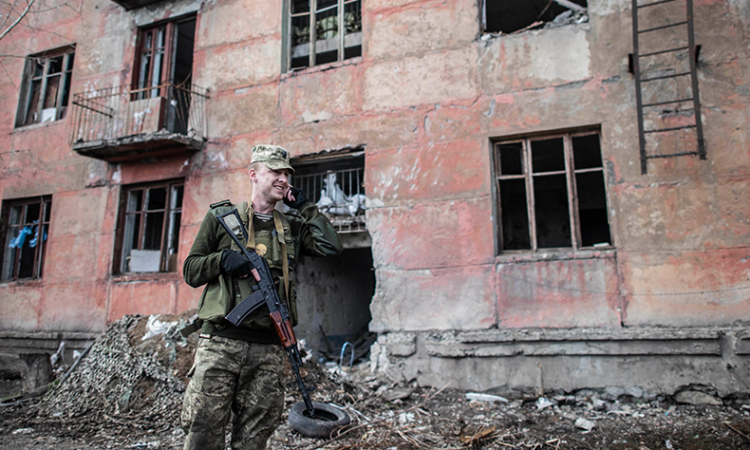 While fighting in eastern Ukraine has decreased, combined Russian-separatist forces continue their pattern of ceasefire violations and provocations. 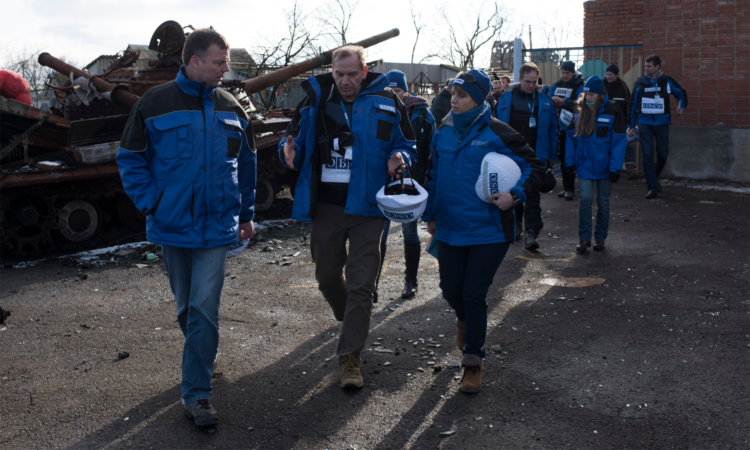 On the 30th anniversary of the Chornobyl disaster, our thoughts remain with the victims, from the emergency workers who gave their lives to prevent an even greater disaster, to those living in the area affected by the fallout. 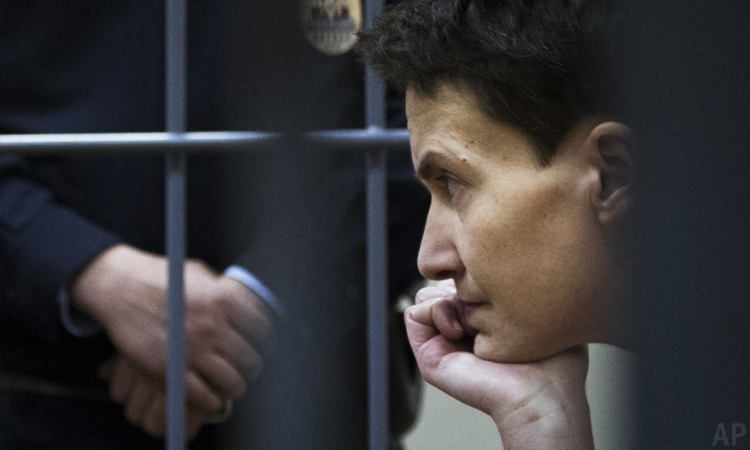 As President Obama told President Putin in their April 18 phone call, Russia must release Ms. Savchenko without delay. 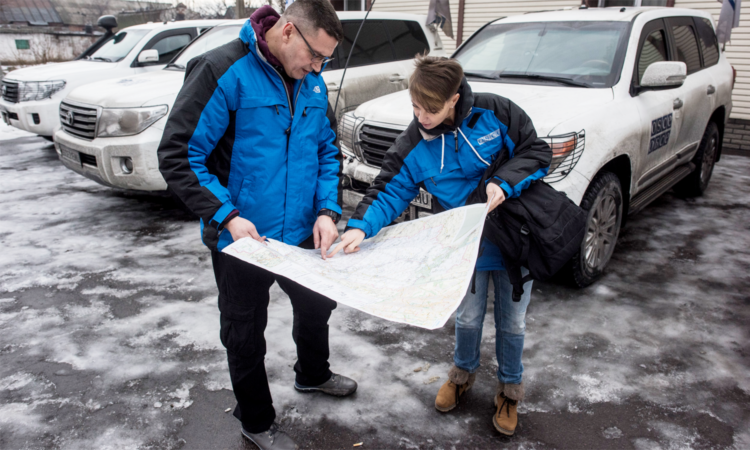 When the U.S. raises factual information on what is happening on the ground in Ukraine, we do so because it is relevant to finding a solution. 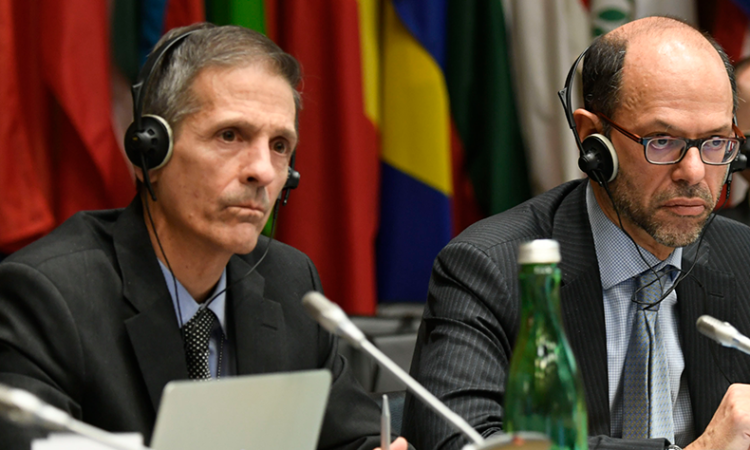 We have to acknowledge that the Russian Federation is the key driver of the conflict, and has been the key driver of the conflict from the outset. 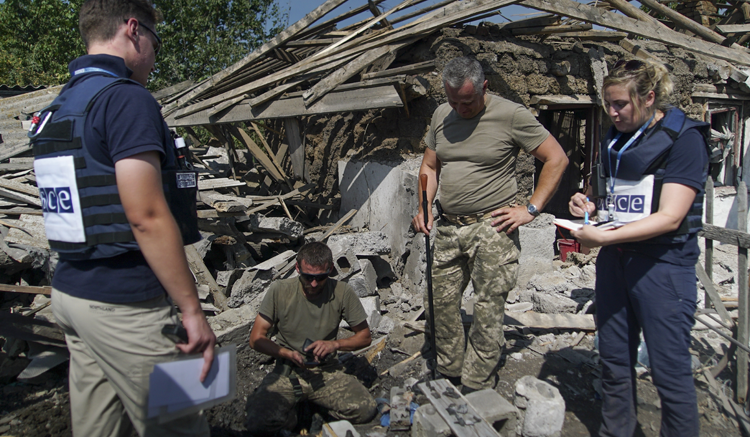 The U.S. calls for an immediate de-escalation of hostilities along the line of contact in eastern Ukraine. 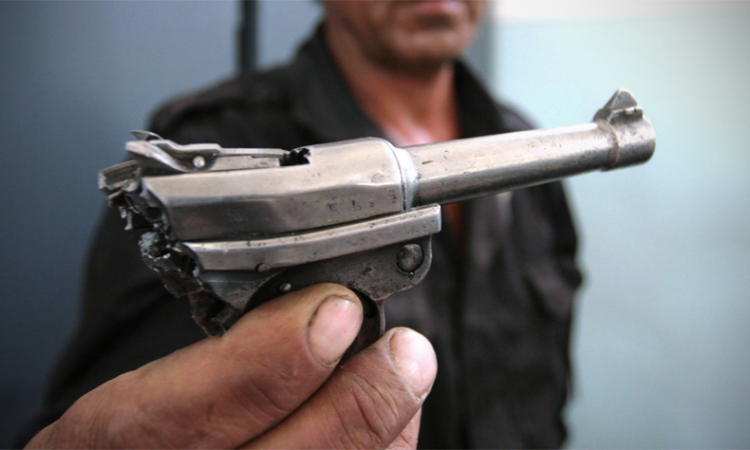 Violence is now at the highest level since the September 1 ceasefire. 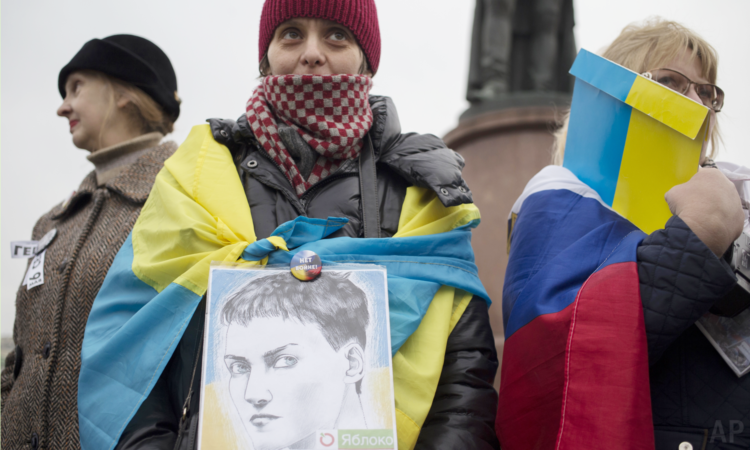 Nadiya Savchenko’s health and her very life are on the line. 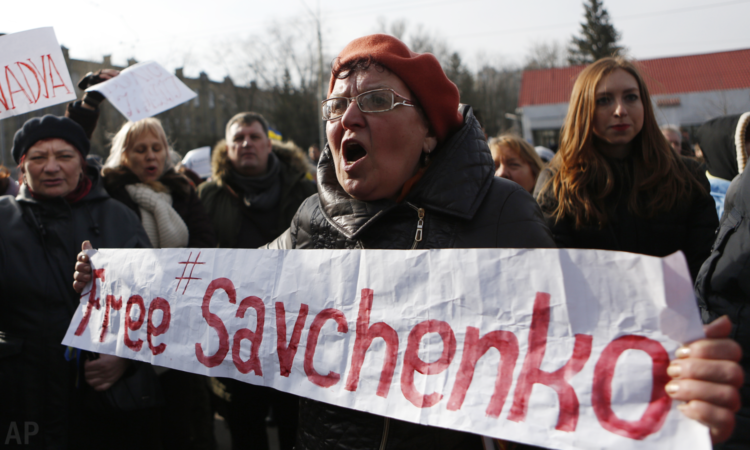 We reiterate that Russia is responsible for her well-being. 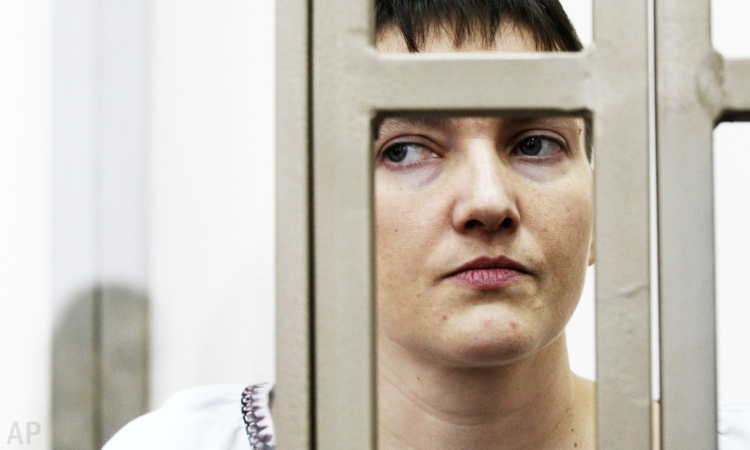 The United States condemns the ongoing detention of Nadiya Savchenko for politically-motivated purposes and calls for her immediate release. 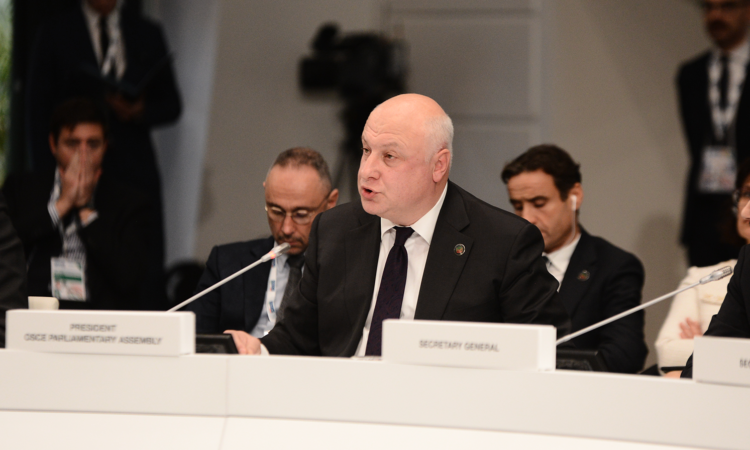 We find it deeply regrettable that Russia continues to block the expansion of the geographic scope of the Observer Mission, despite the clear, strong, and continued support from other participating States to do so. 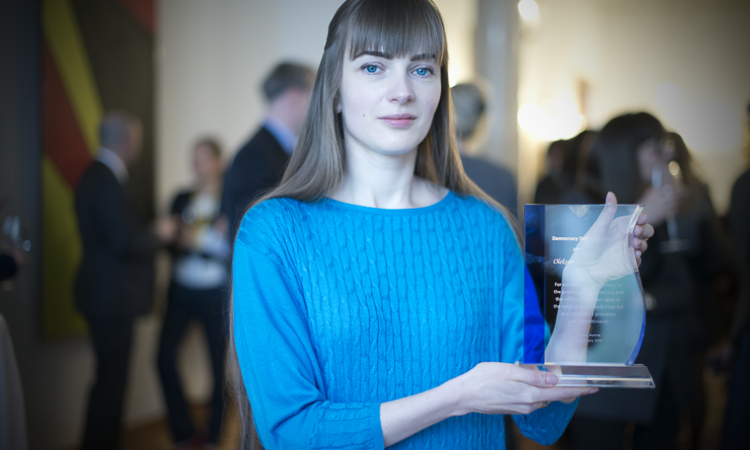 The voices of people like Oleksandra remind everyone that there is no alternative to continuing the fight for reform and for a stronger Ukraine. 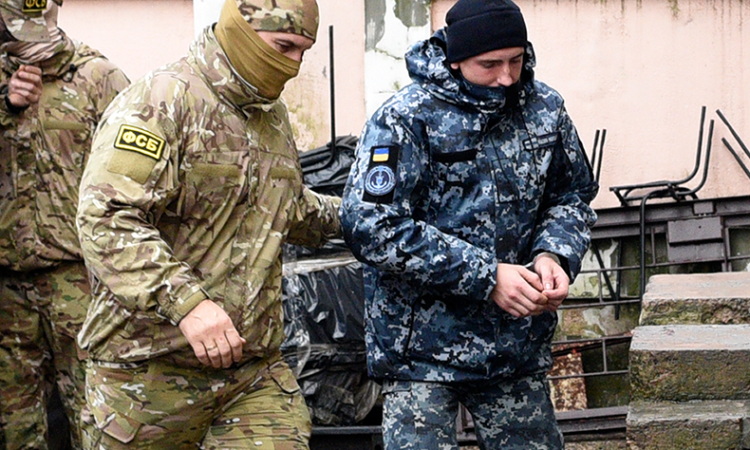 The United States condemns the continued detention of Nadiya Savchenko, Oleg Sentsov, Oleksander Kolchenko, Stanislav Klikh, Mykola Karpyuk, Akhtem Chiygoz, and all other Ukrainians unjustly held in Russia and in Russian-occupied Crimea. 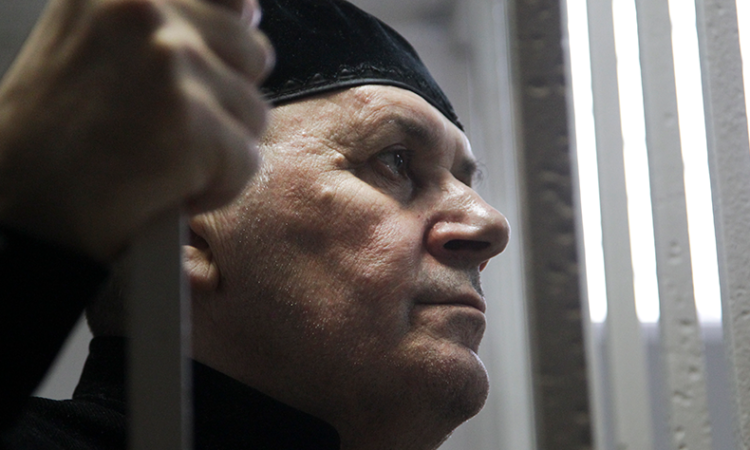 Human rights groups estimate that there are currently at least 20 such cases. 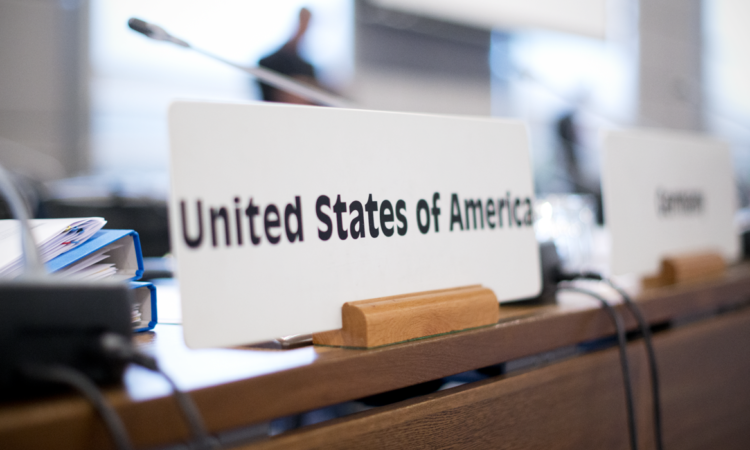 The United States remains deeply concerned about the escalation of fighting at the line of contact in eastern Ukraine. 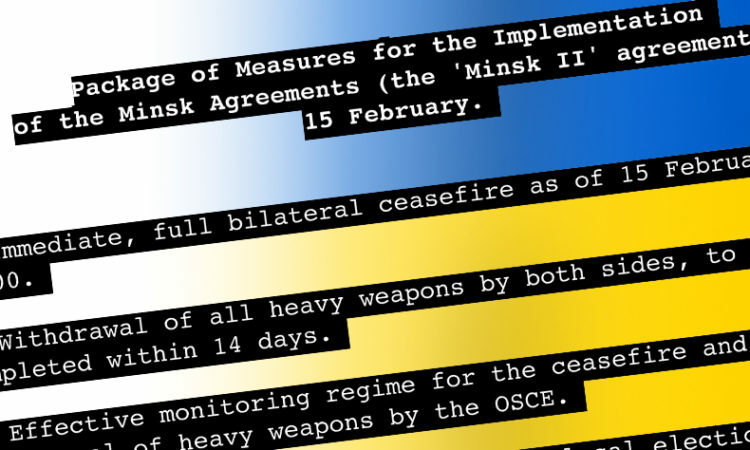 One year ago today, Russia signed the Minsk Package of Measures, pledging an end to hostilities in eastern Ukraine within 72 hours. 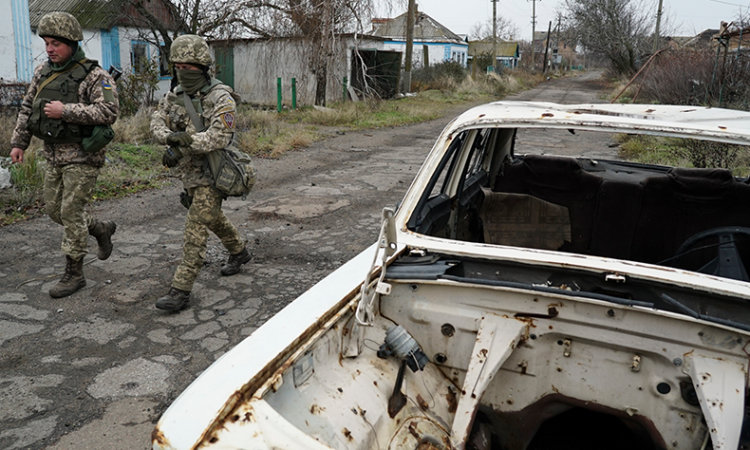 Instead, Russian-led separatist forces escalated their aggression.